Keen observers of the flowers that bloom in spring probably noticed that there weren’t any coltsfoot flowers in my last post. That’s because I hadn’t seen any yet, even though I had been to every place I knew of where they bloom. 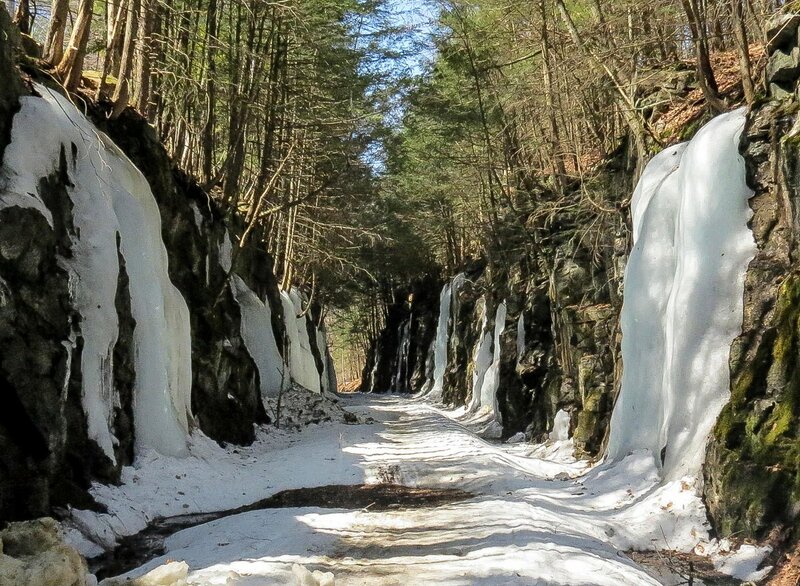 Except one, I remembered; the deep cut rail trail in Westmoreland that the ice climbers call the “Icebox” has a lot of coltsfoot plants along the trail. So, though I wasn’t sure what I’d find, last Sunday off I went. What I found was where winter has been hiding. 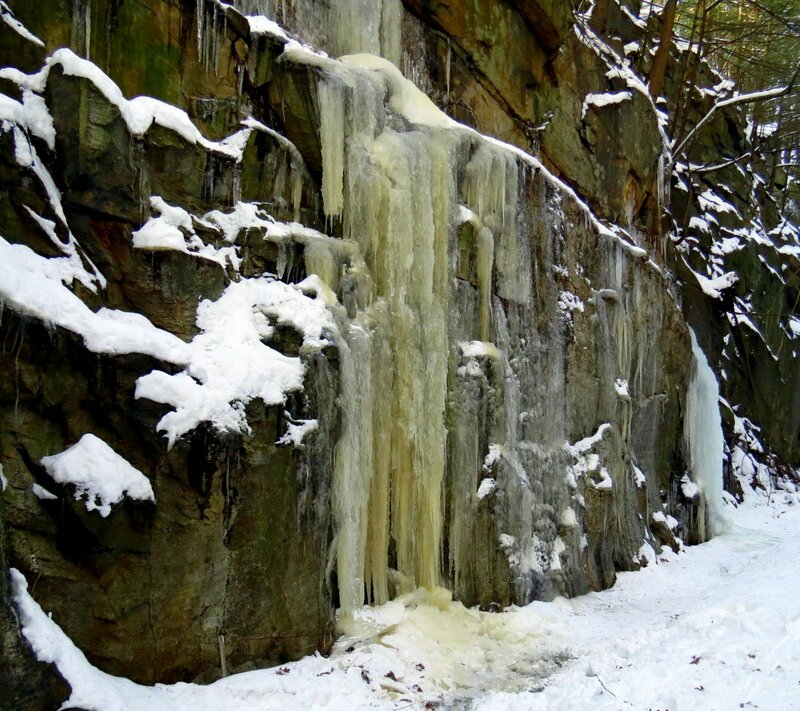 As the above photo shows there was still plenty of ice clinging to the man-made canyon walls. 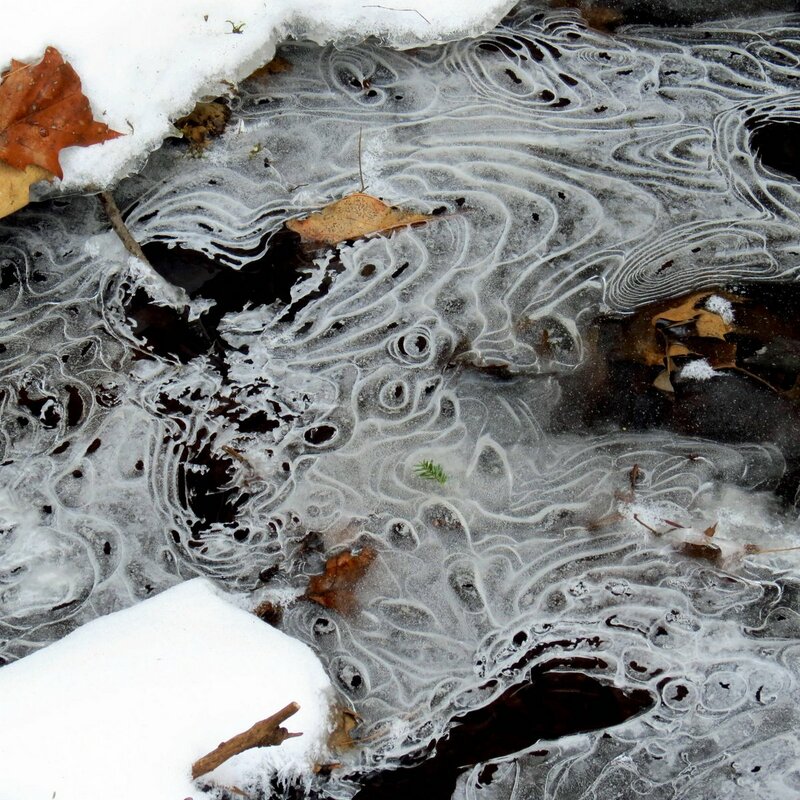 But the ice was rotten and melting quickly. Ice this big can be very dangerous when it falls, so I don’t get near it. I thought it had been warm enough to melt all the ice and snow here but obviously I was wrong. 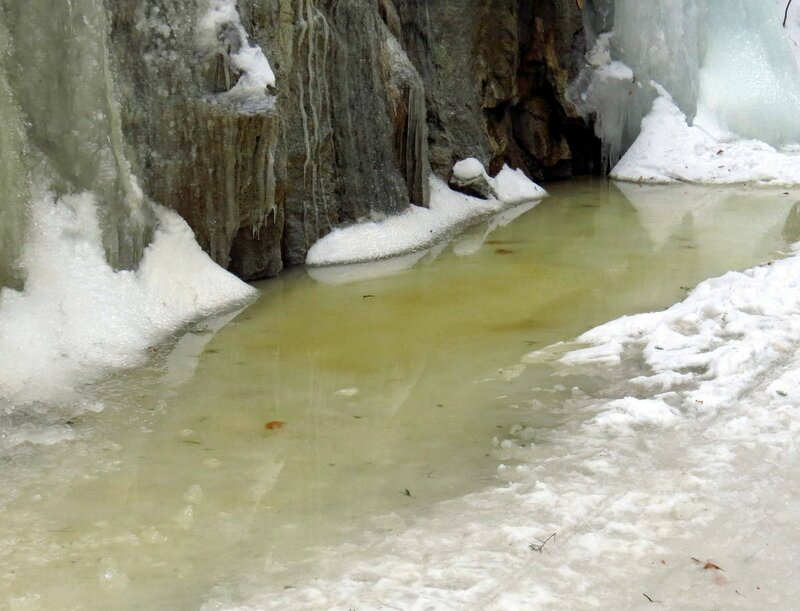 The opaque gray color is a sure sign of rotten ice. 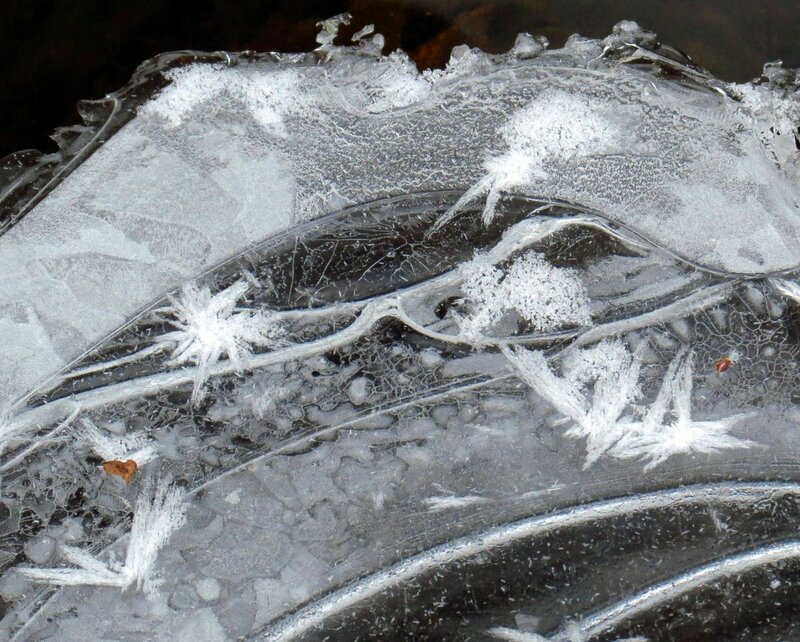 Ice is rotten when the bonds between ice crystals begin to break down because of air and dirt coming between them. Water was literally pouring from the walls. 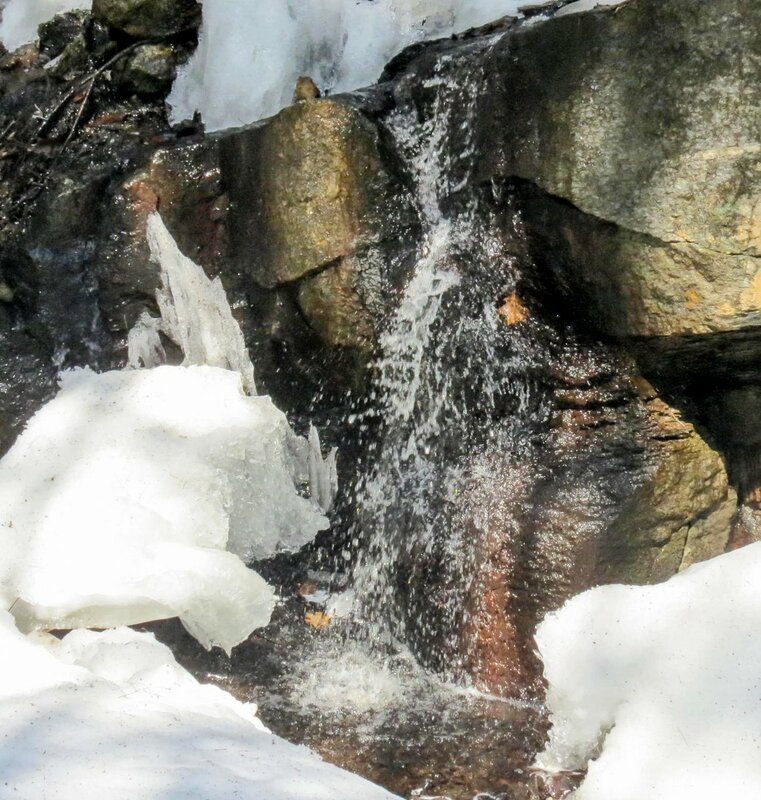 The groundwater always seeps and drips here but on this day it was running with more force than I’ve ever seen so I think it was meltwater. 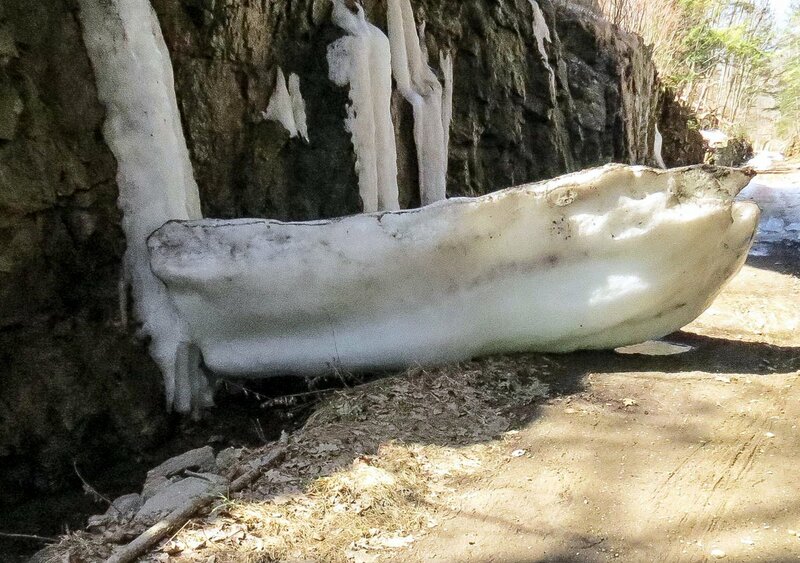 And then I saw this fallen ice column. It looked like a boat and was as big as one that would fit 5 people. If this ever fell on a person it would crush them, so I decided to turn back and get out of here. The view further down the trail didn’t look safe at all with all the ice columns melting in the sunshine, and there was what looked like a pile of ice down there. 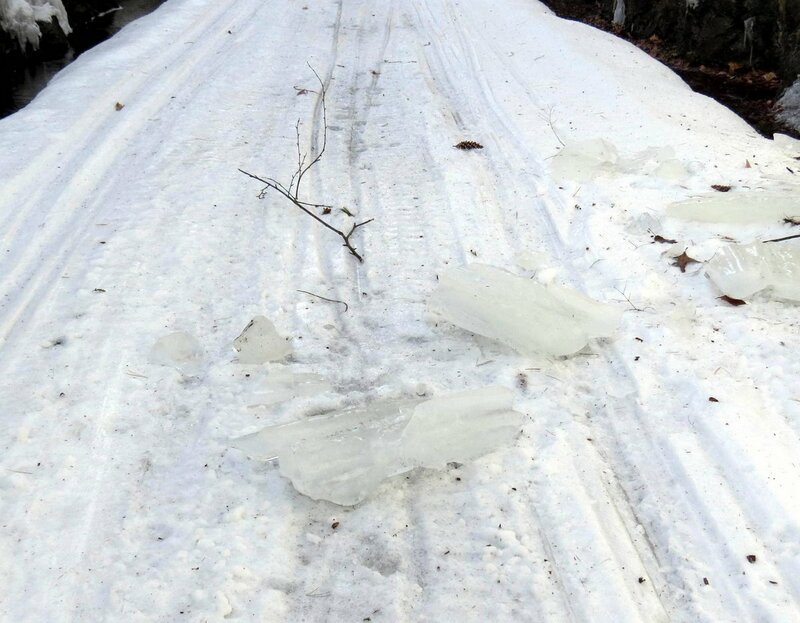 That’s what it was; a pile of huge ice chunks all across the trail. 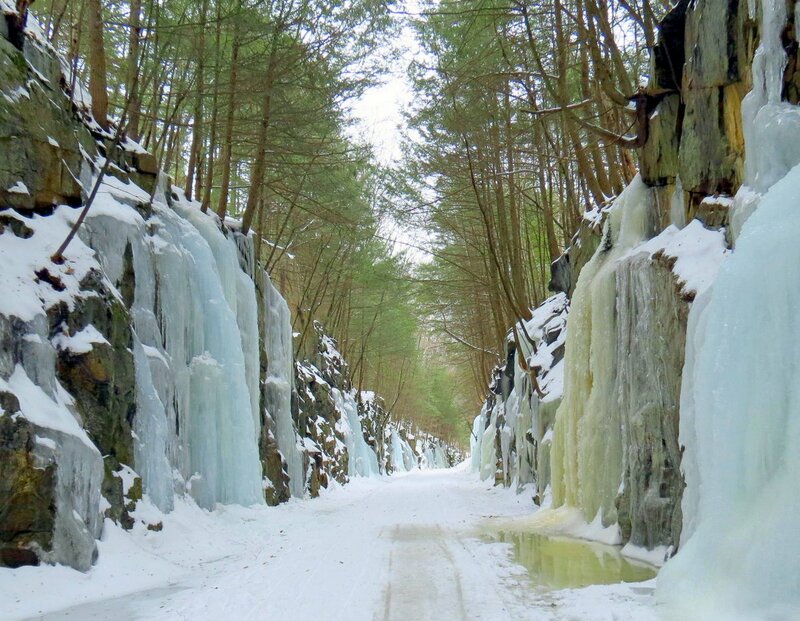 I know it’s hard to judge the scale of things in a photo but these ice columns are as big as trees. Actually there is a fallen tree over on the left. 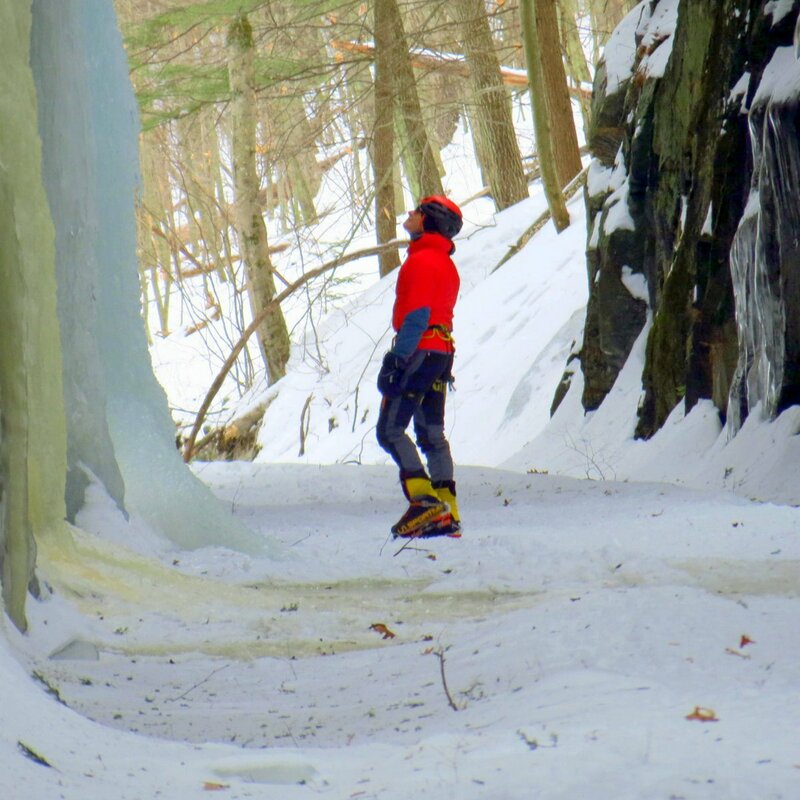 Here’s a shot of some ice climbers taken in February to give new readers an idea of the size of this ice. Some of it is huge. 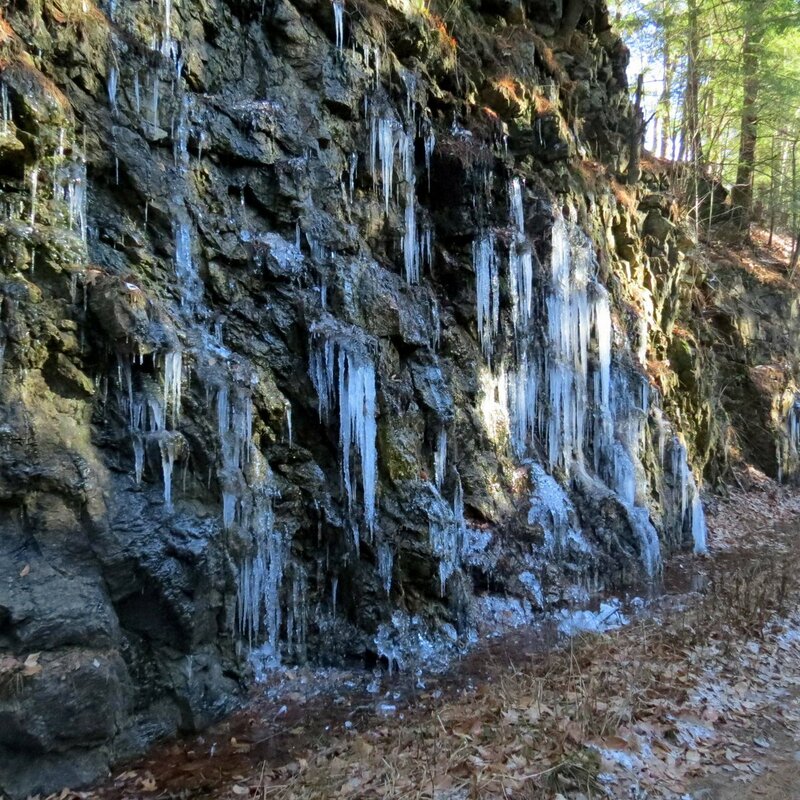 I think that part of the reason the ice columns fall like they do is because the water in the drainage ditches along the side of the trail erode their bases away, as can be seen in this photo. 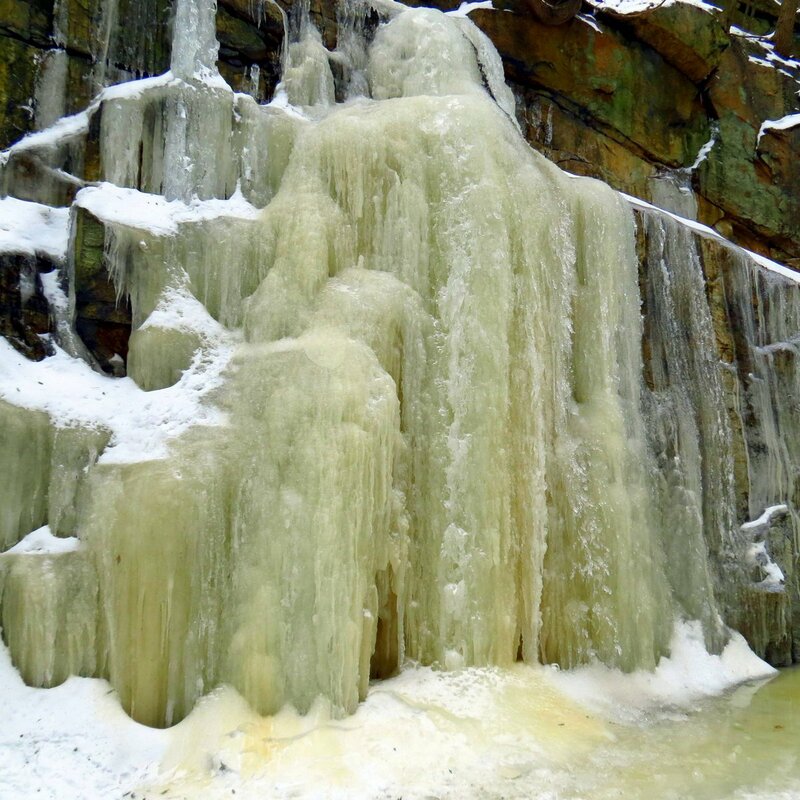 Ice isn’t the only thing that falls here. 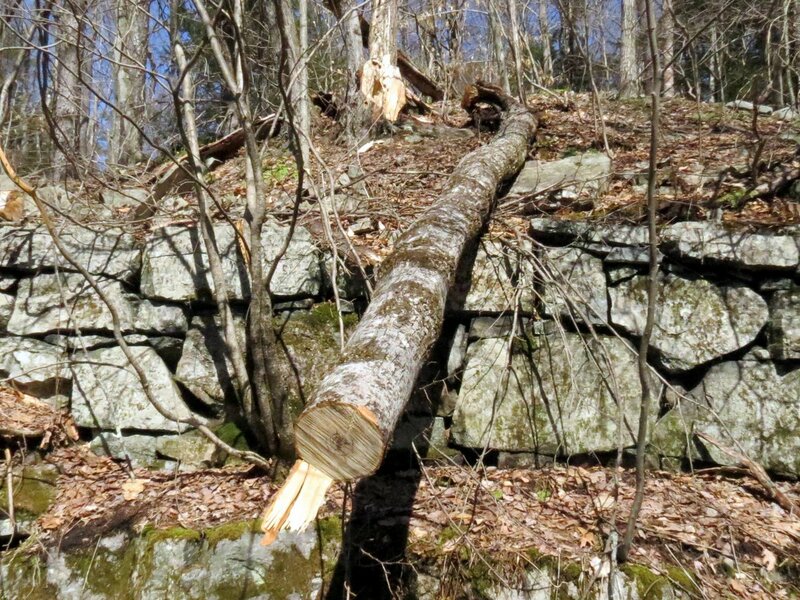 Stones fall from the ledges regularly and I saw at least three fallen trees on this day. I’m reminded each time I come here how dangerous the place can be, but it is also a place where I can see things that I can’t see anywhere else. 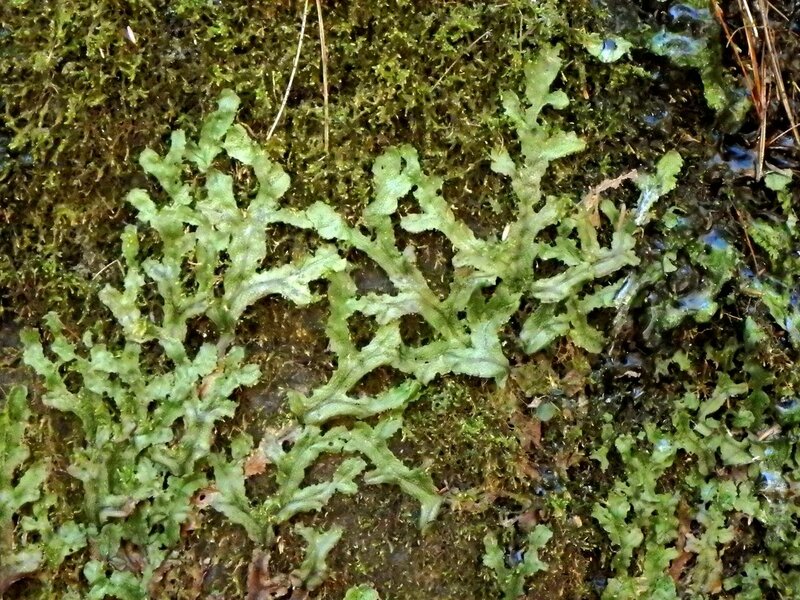 One of the things I can’t see anywhere else is the great scented liverwort (Conocephalum conicum.) They grow here by the thousands and I’ve learned to expect them to look a little tattered and worn in spring, because most are covered by ice all winter. By June though they’ll all be a beautiful pea green. 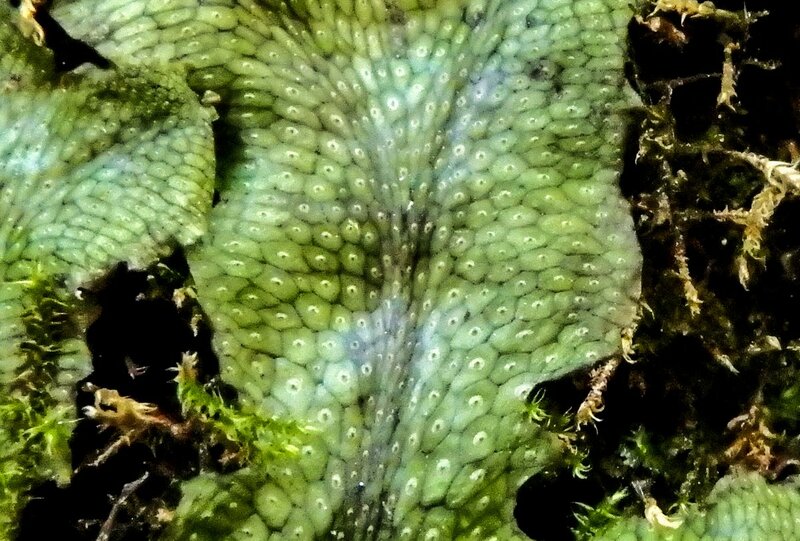 Another name for the plant is snakeskin liverwort, for obvious reasons. Its pores and air chambers our outlined on its surface, and that gives it a very reptilian look. In my opinion it is one of the most beautiful of its kind. I decided to look a little closer at areas with no ice or leaning trees nearby and I’m glad I did because I saw many interesting things, like what I believe is yew leaved pocket moss (Fissidens taxifolius.) 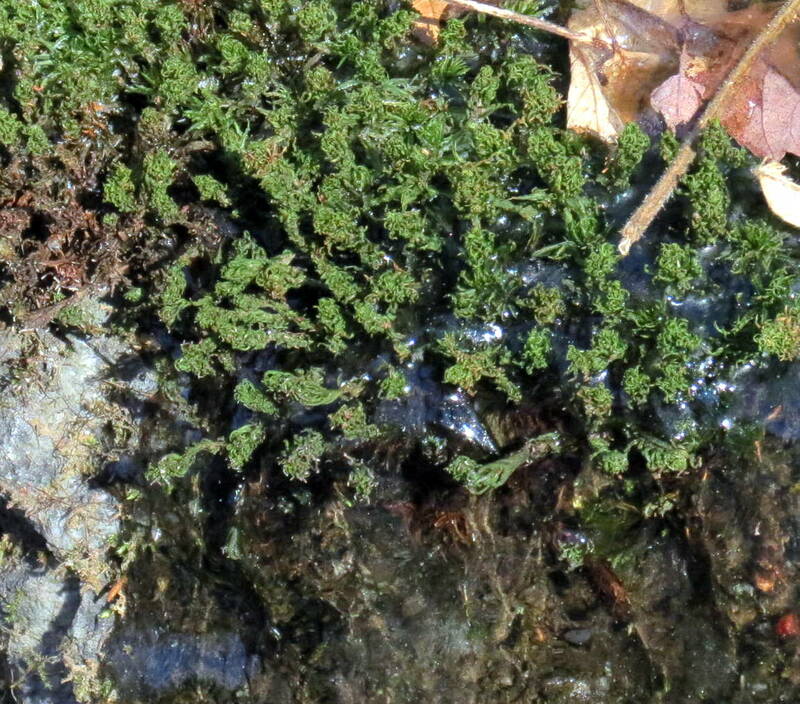 This little moss grows in very wet places on the ledges where water drips on it almost constantly. 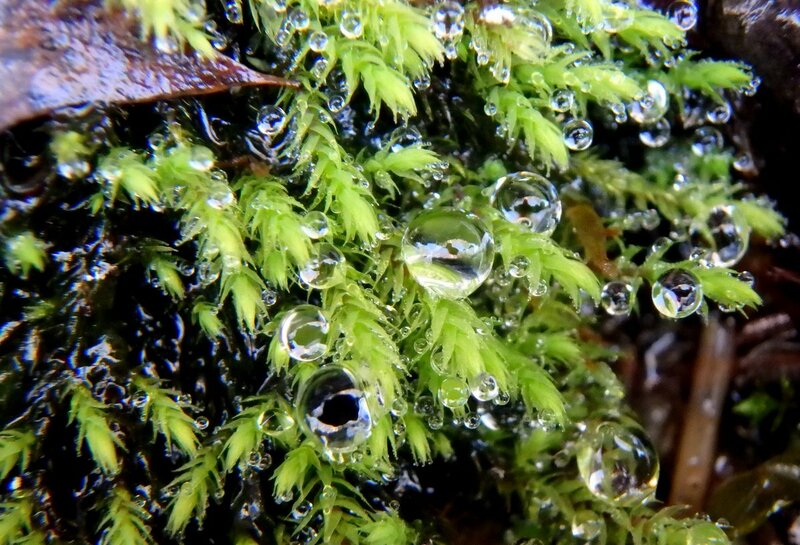 Pocket mosses get their common name from the way the lower lobe of each leaf curls around its stem to form a pocket. This example was a little beat up because it has also most likely been under ice all winter. Grasses were just coming up in the drainage ditches that follow along each side of the trail. 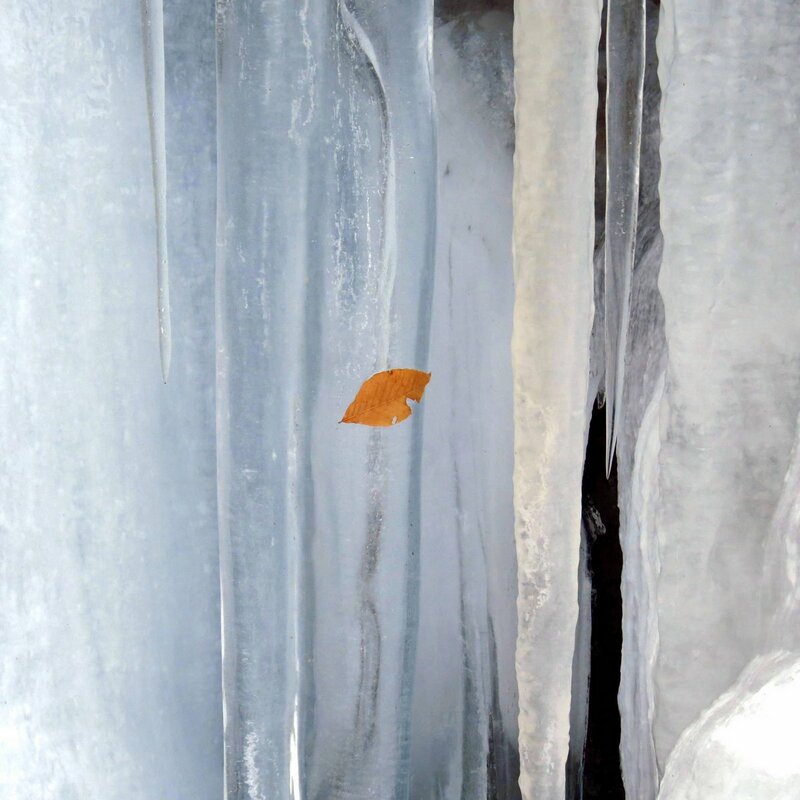 The beech leaf in the foreground will give you an idea of their size. 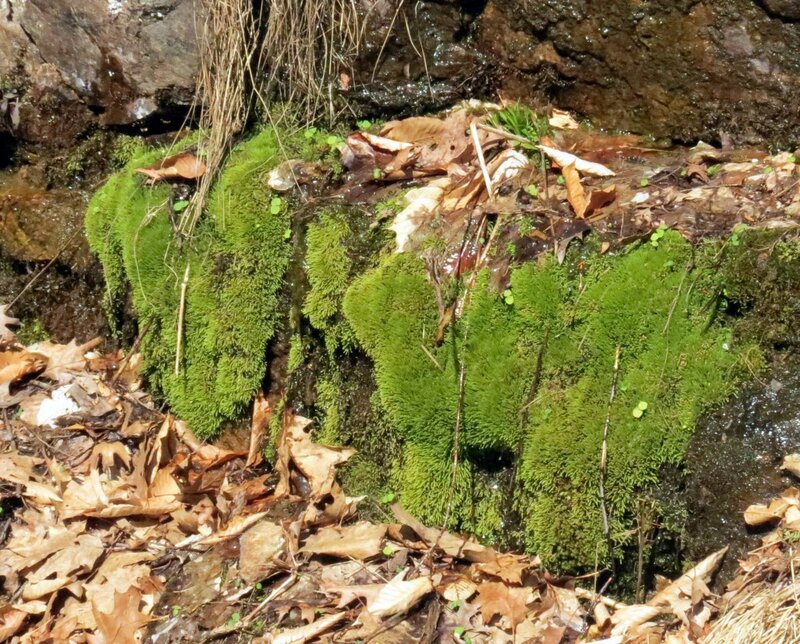 I saw a large patch of moss on part of a ledge. 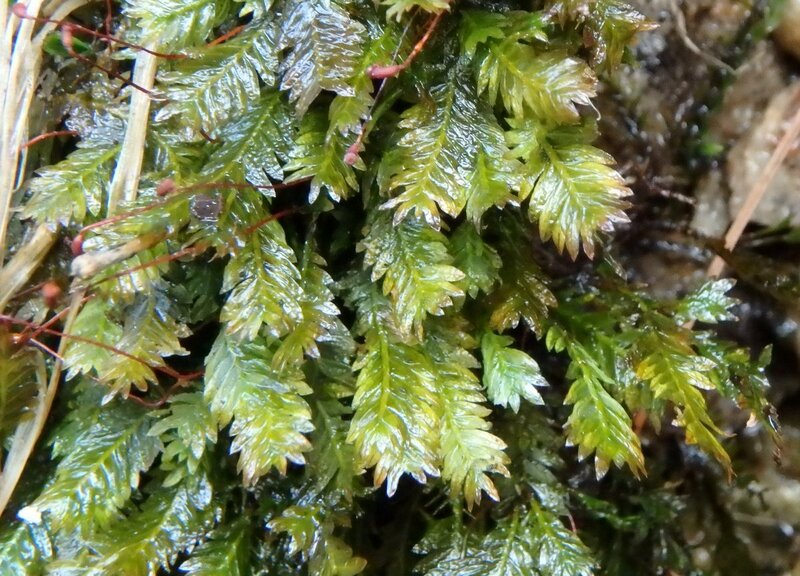 It turned out to be Hedwigia ciliata, which is a very common but an uncommonly beautiful moss. 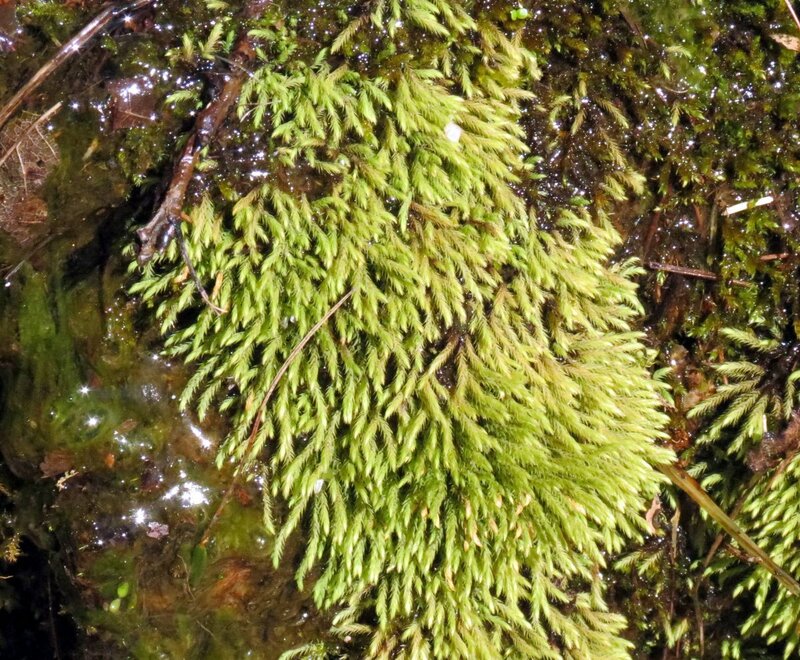 It’s also called white tipped moss because its branch tips are often bright white. I usually see it on stones in full sun. 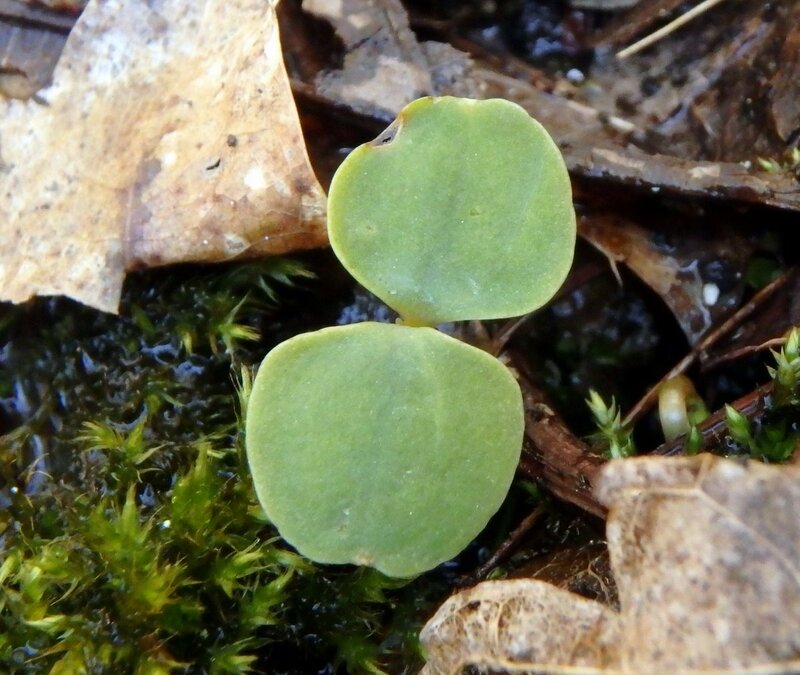 Seedlings were coming up among the mosses. I’m not sure what they are because they had no true leaves yet but I do know that Jack in the pulpit plants grow all along this section of ledge. Many different species of aster also grow on the stone. It reminds me of a radish seedling. I found that green algae (Trentepohlia aurea) darkens when wet. 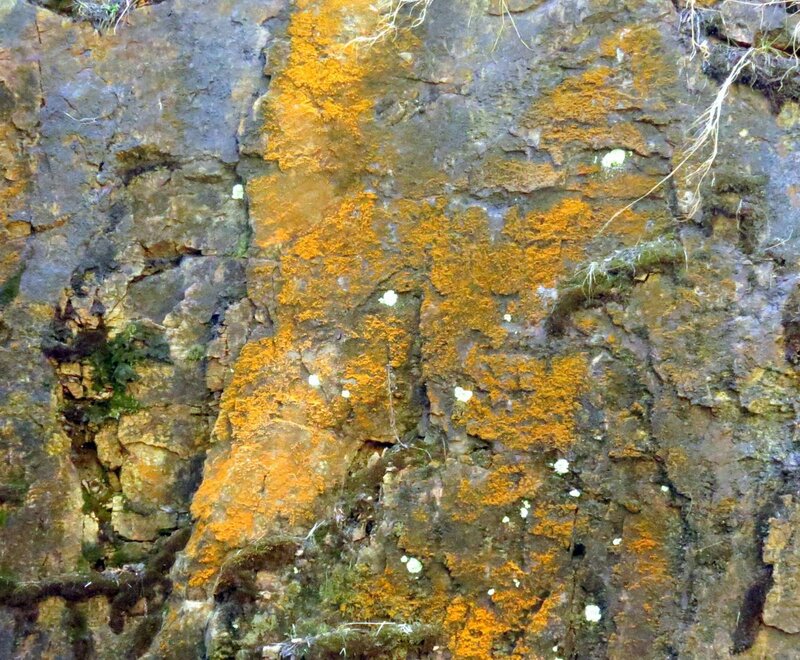 This hairy alga is orange because of the pigment beta carotene hiding the green chlorophyll. 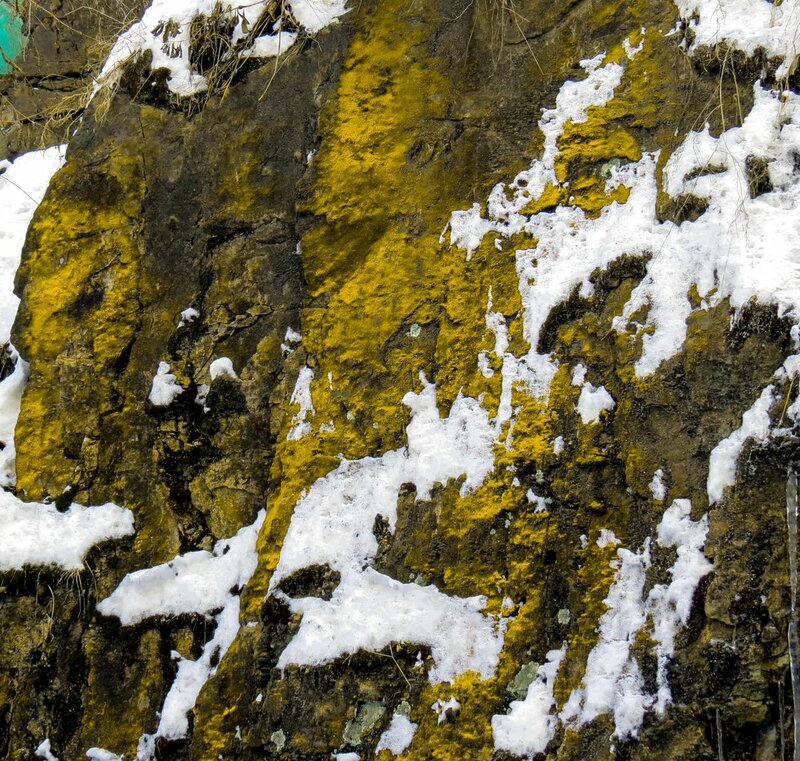 It grows out of direct sunlight on the damp rock walls. 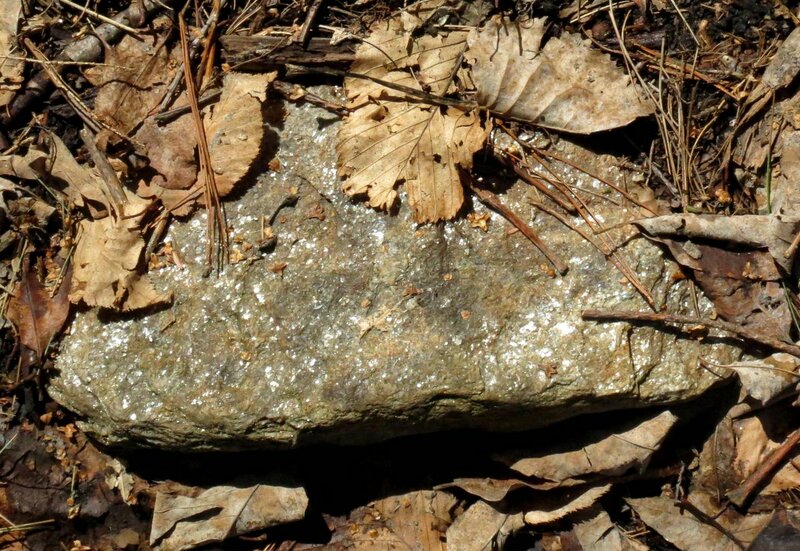 I thought I’d practice my photography skills by trying to get a shot of a stone filled with mica. It isn’t as easy as it sounds because each piece of mica is like a tiny mirror that amplifies the sunlight. 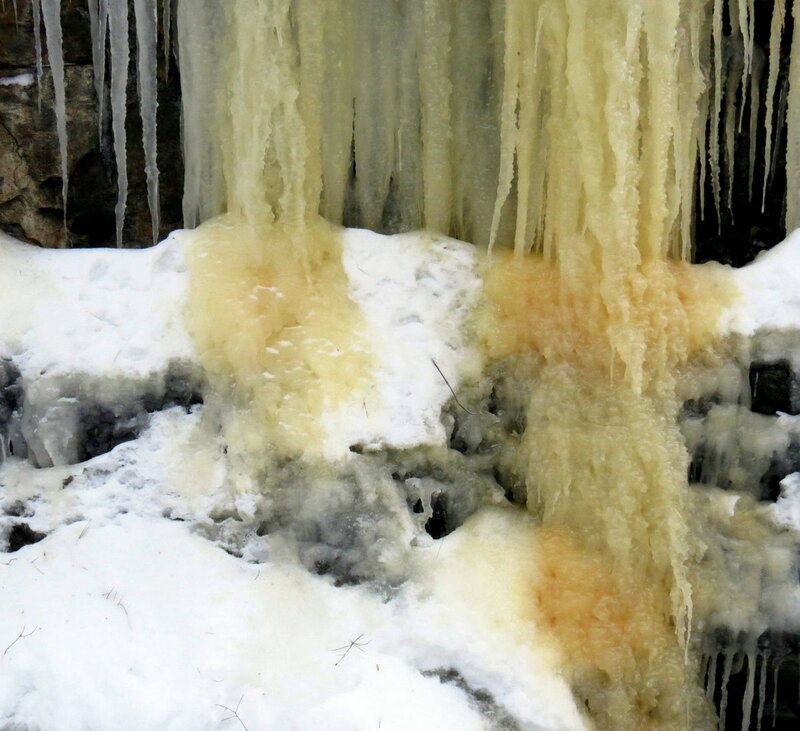 If I could have gotten closer to the ice columns I would have shown you that the ice comes in many colors here. 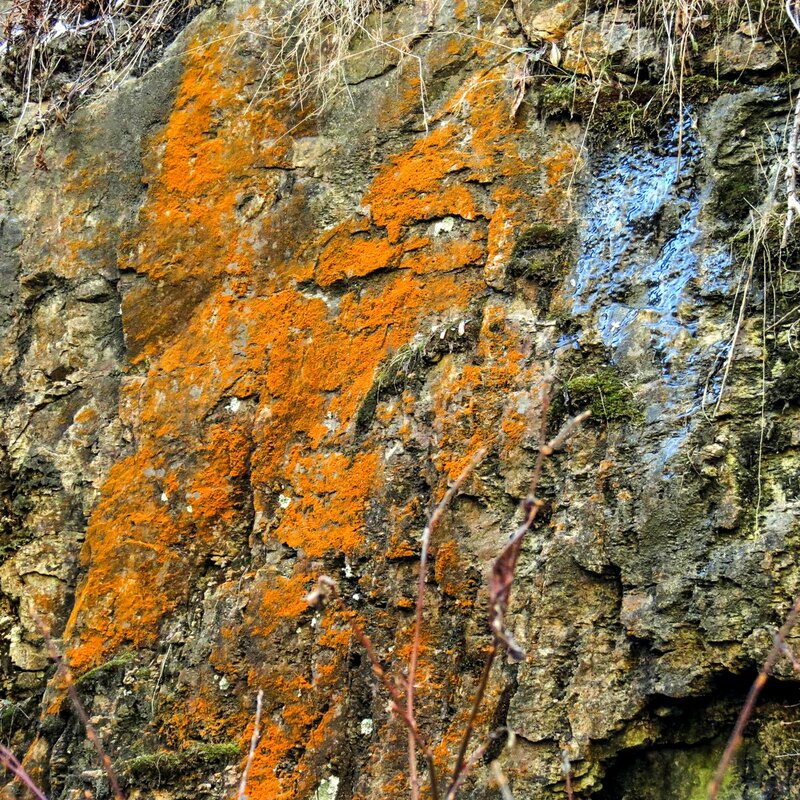 One of the colors is a reddish orange and I believe that it comes from iron leaching from the soil and stone. 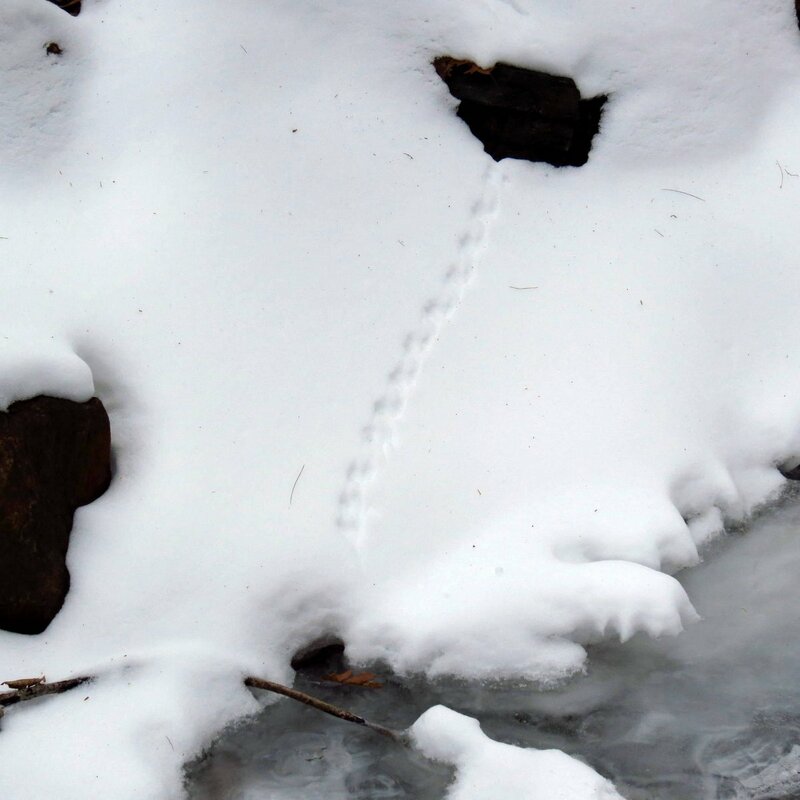 The above photo is of a spot in the woods where a pool of water was. 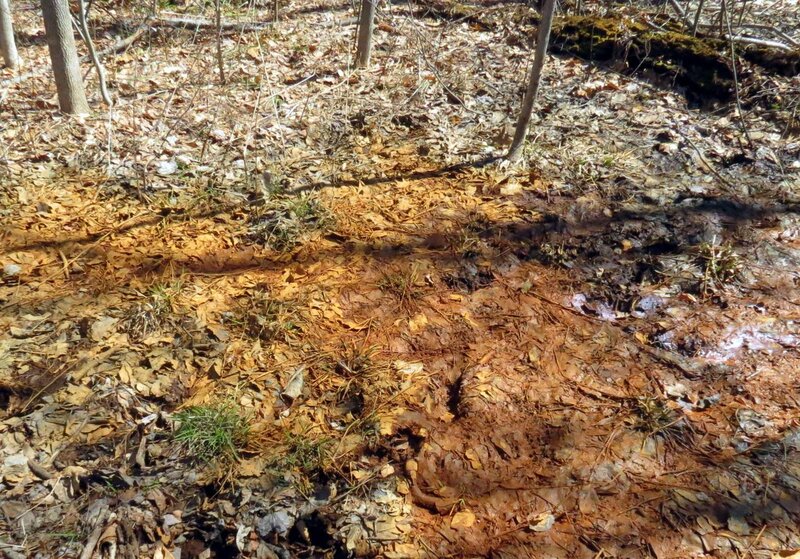 When the water evaporated it left behind the minerals it carried, in this case probably iron. I saw this bubbly mass in one of the drainage ditches. I’m not sure but I think it’s some type of algae. It reminds me of the spyrogyra algae I saw a few years ago. 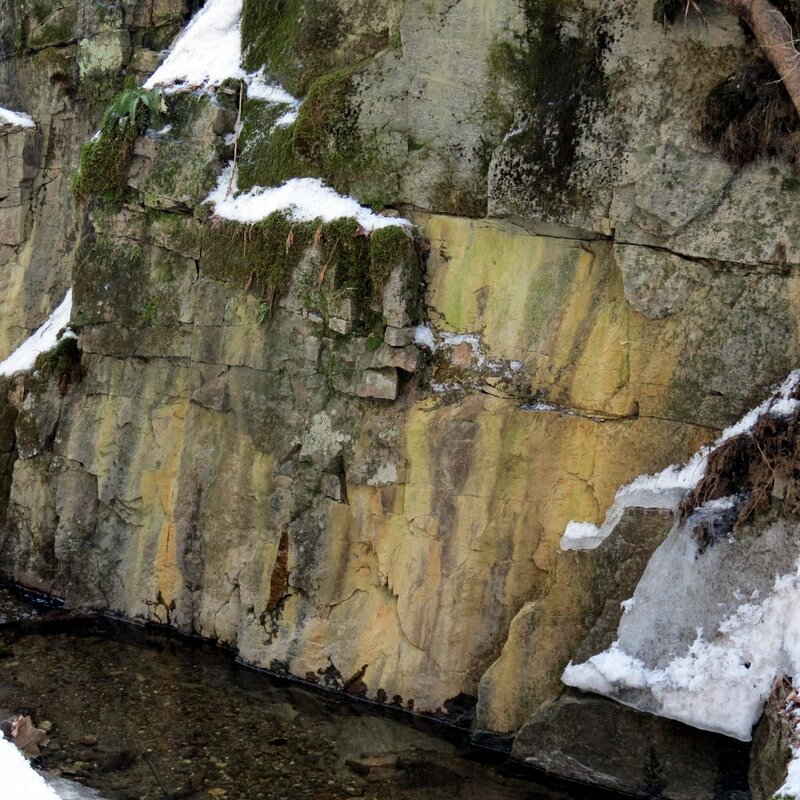 That example was on a very wet stone outcrop and this one was in water. I’ve read that it is most abundant in early spring and that the bubbles come from trapped gasses. It isn’t something I see regularly. I never did find any coltsfoot flowers to show you but there were plenty of other interesting things to see. 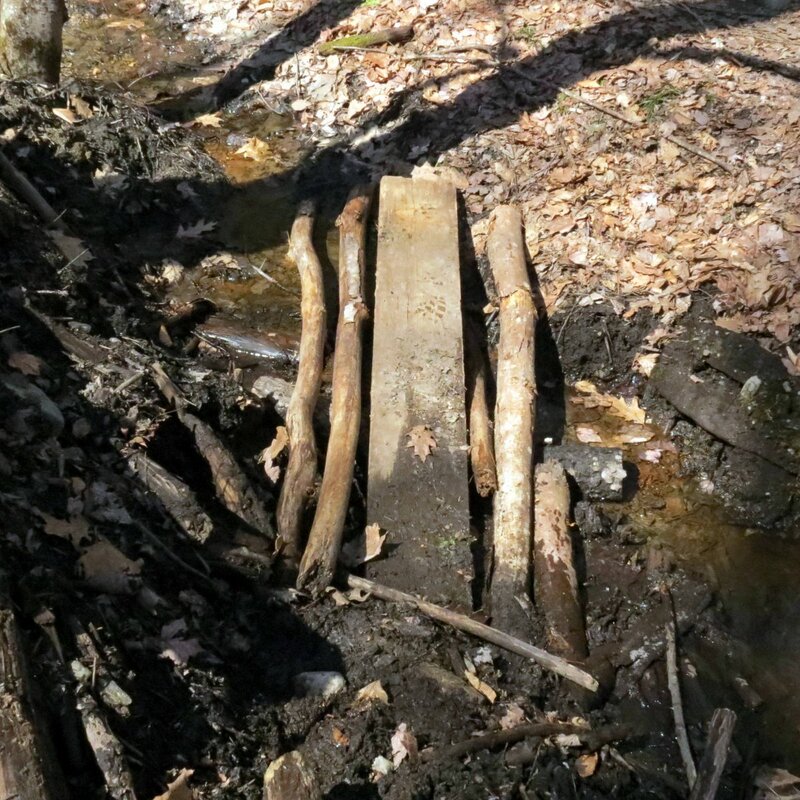 I also never made it all the way to the old lineman’s shack because of all the fallen ice, but I did see a piece of it; this plank from it was being used as a bridge to cross the drainage ditch. 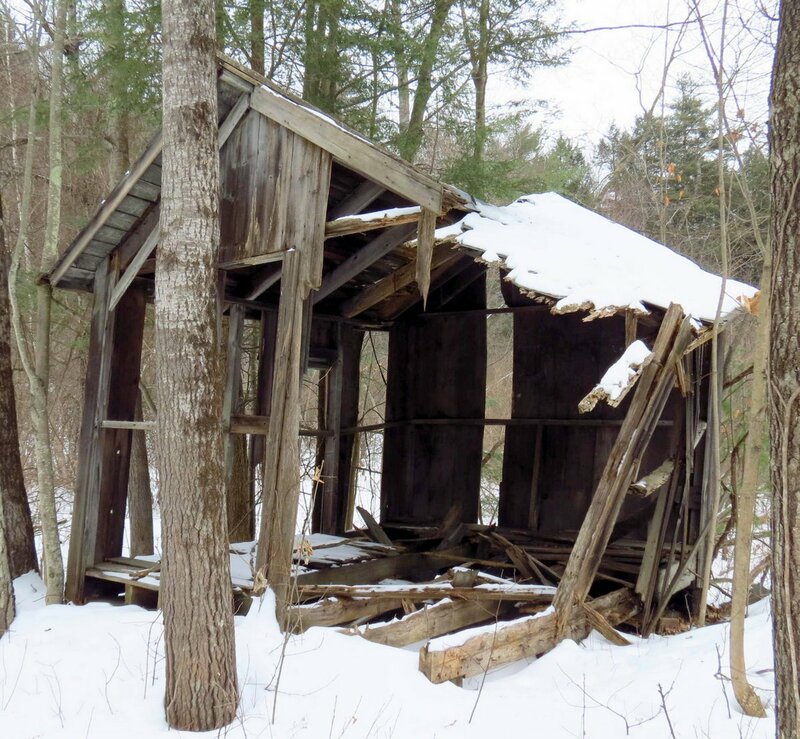 I wish people wouldn’t keep pulling the old shed apart but I don’t suppose anything can be done about it. Nature is never static. It is always changing. Everything is in a constant state of flux. Nothing endures. Everything is in the process of either coming into being or expiring. 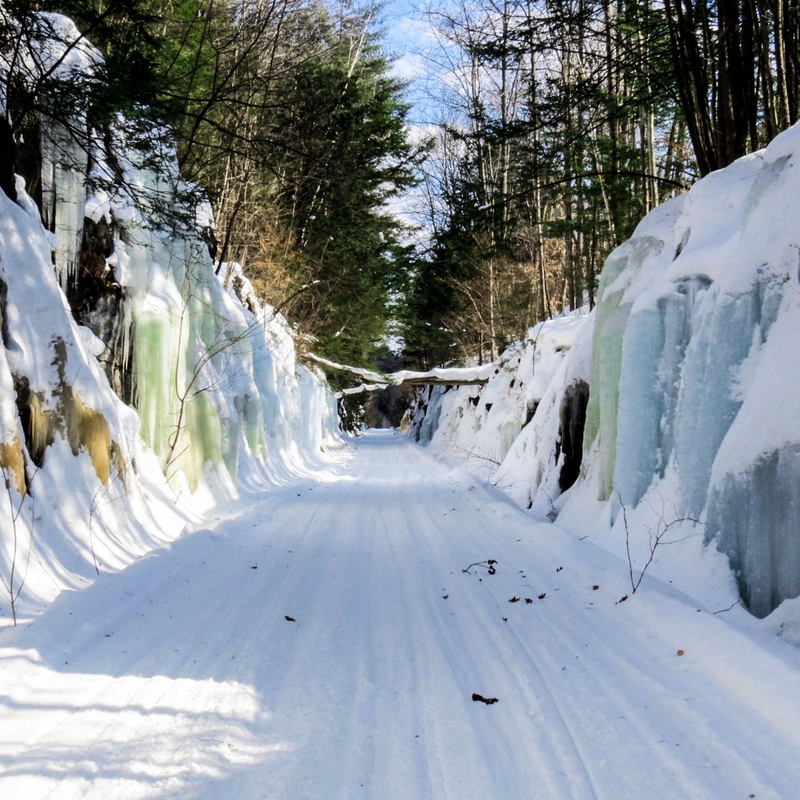 By now you might think I’d had enough of ice but there is a special place called the ice box in Westmoreland, just north of Keene, that I couldn’t go long in winter without visiting. I was here a month ago at the end of December but the ice, which often grows as big as tree trunks, hadn’t grown much by then. 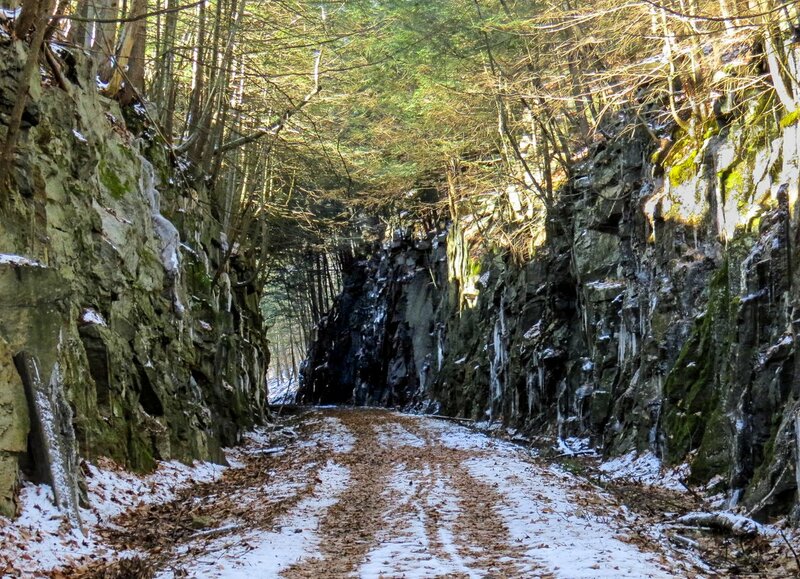 This is a deep cut through solid rock made by the Cheshire Railroad back in the mid-1800s which has become a popular spot for learning how to ice climb. 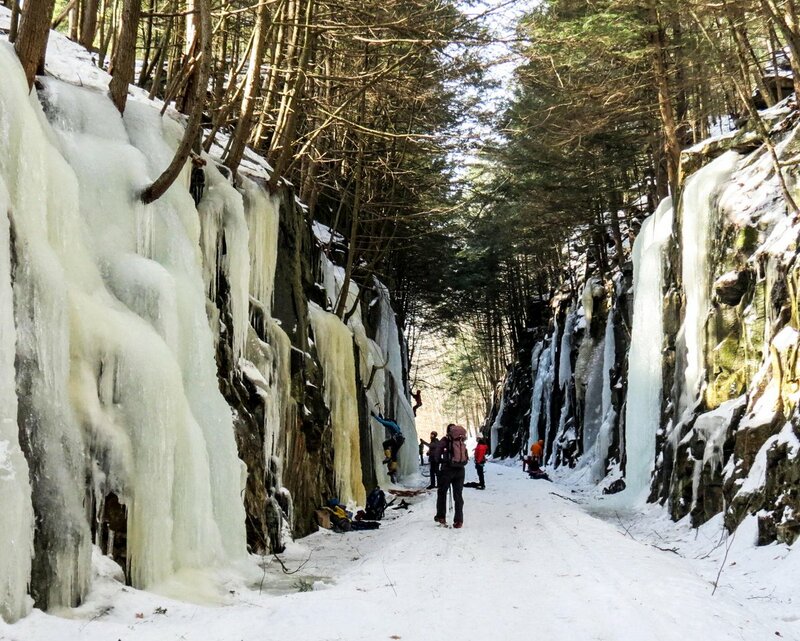 The New Hampshire branch of the Appalachian Mountain Club holds ice climbing clinics here and on this day there were more climbers here than I had ever seen. They were young and old and from what I gathered, all skill levels. As I usually do I just wandered through quickly, snapping the shutter now and then. I worry about distracting the beginning climbers so I don’t often speak to anyone or even stand and watch. I’ve asked in the past if my use of a camera bothered them and they’ve always said no, but that wouldn’t make me feel any better if someone fell because they were wondering what I was doing instead of paying attention to what they should have been doing. 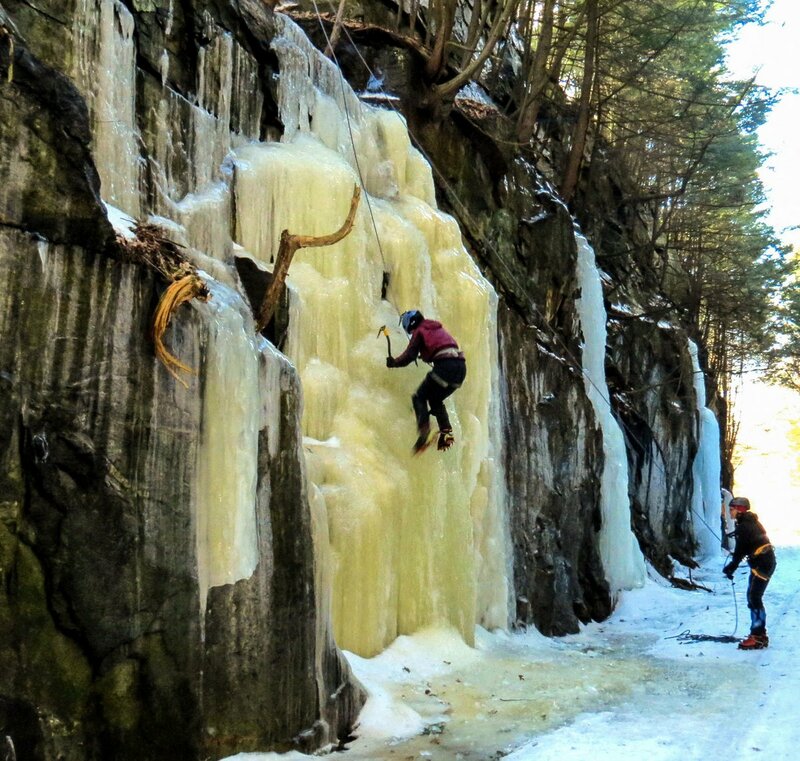 What I’d like to ask them is why they don’t ever seem to climb the colored ice. It’s possible that it isn’t as stable as the clear or blue ice. 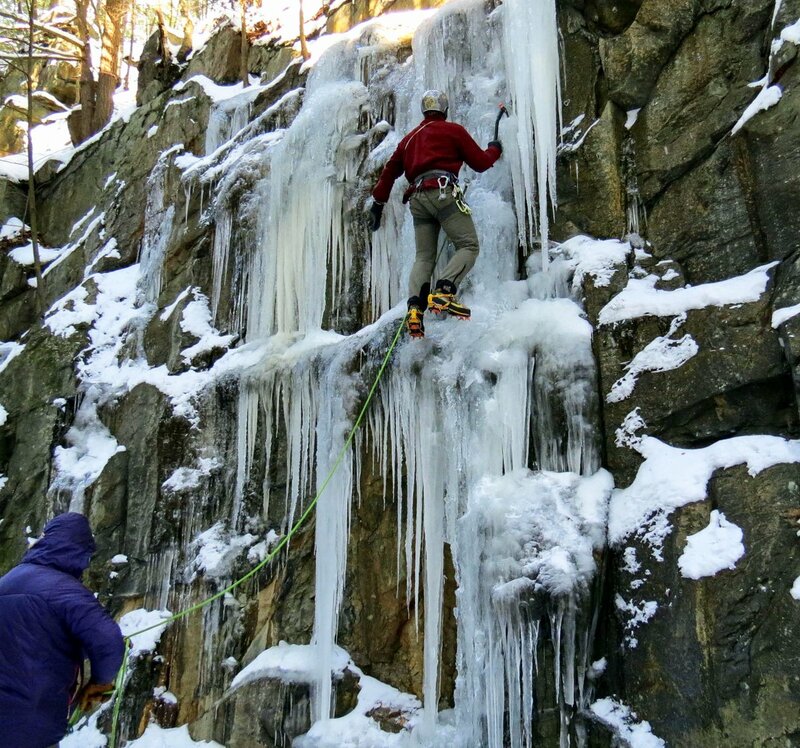 Even though blue ice is the densest they seem to stay on the clear ice when climbing. I’ve read that ice is plastic and actually has quite a lot of give and movement, so maybe that has something to do with it. 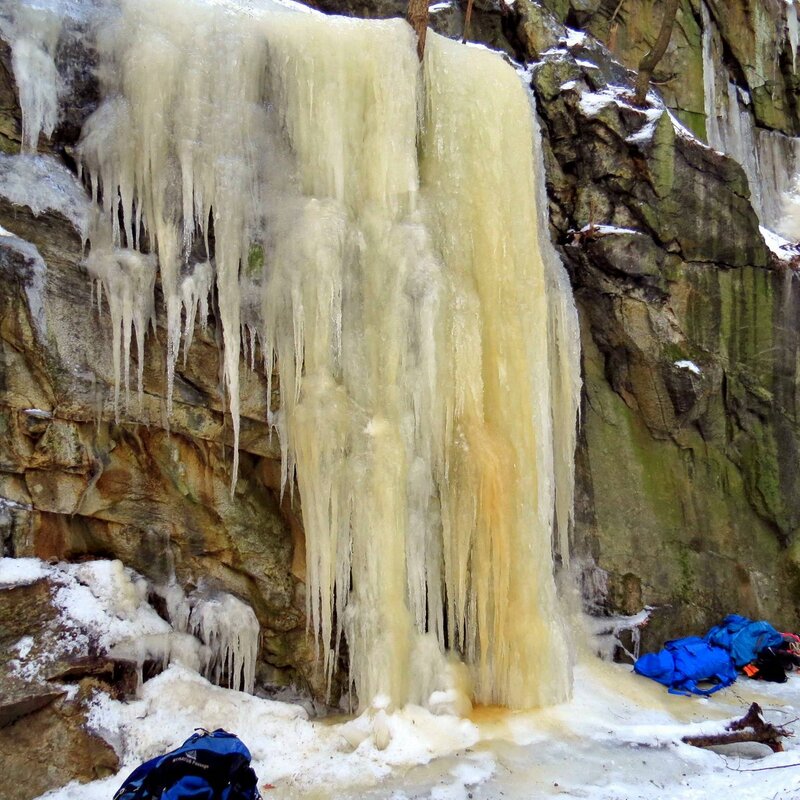 All of the bags and packs that you see in this photo are what the ice climbers use to pack their ropes out here. They use lots of rope! These ledges soar up to what I would guess is about 50 feet in places and the ice columns sometimes reach all the way to the top. As I’ve said, they can also grow to the size of large tree trunks and they can be amazing things to see. 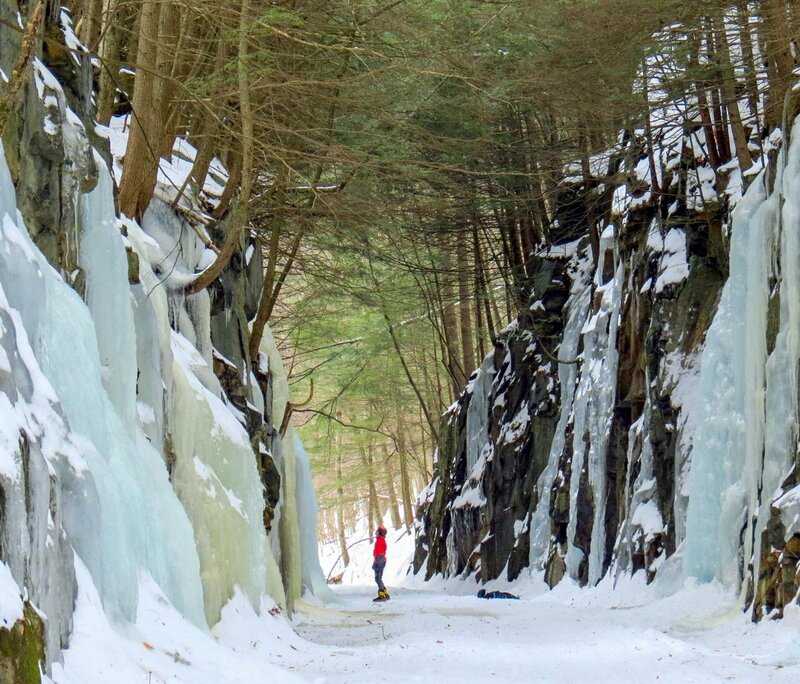 Sometimes it isn’t just their size that makes the ice columns amazing. It’s their beauty as well. 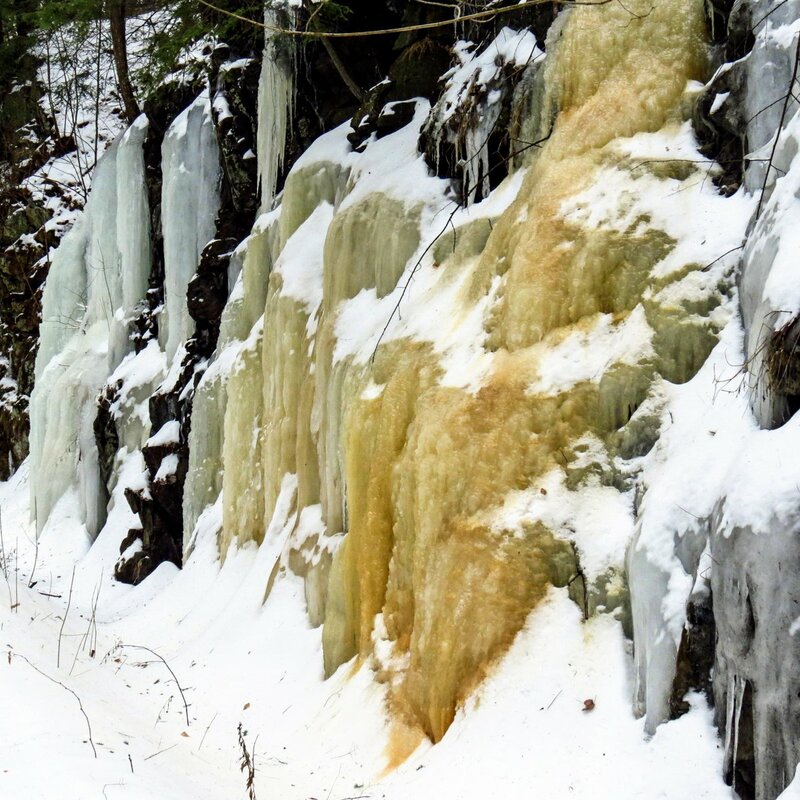 I believe that the colors in the ice come from mineral seepage in the groundwater that forms the ice columns, and I believe that simply because I can’t come up with any other plausible explanations. 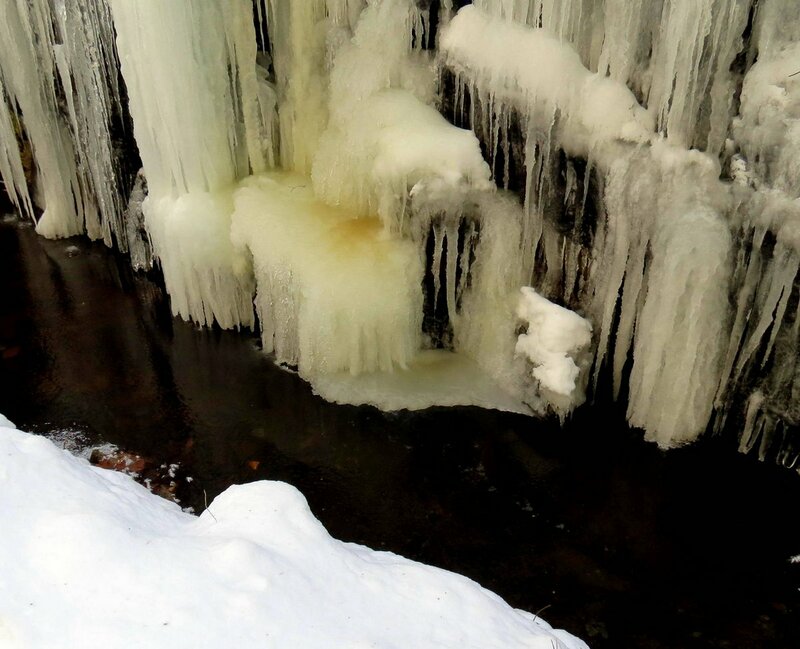 I’ve seen brown ice, green ice, orange ice, blue ice, red ice, and even black ice on these walls, so there must be some kind of mineral soup going on here. I should say that I know regular readers of this blog have heard me say these things many times but there are new readers coming on board all the time, so I hope you’ll understand why I keep repeating what I say about this and some of other places I visit. This place especially, seems to fascinate those who haven’t ever seen anything like it. It really is quite amazing even to me, and I’ve seen it countless times. I like the far southern end of the canyon; the end away from the climbers, because there is never anyone here. 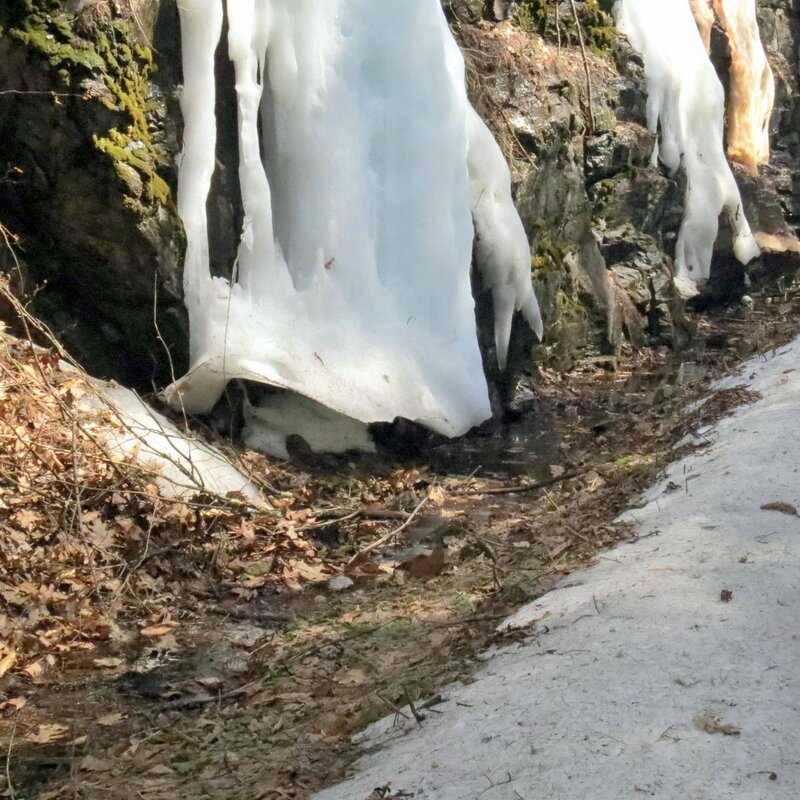 I think it might be because the ice receives too much sunshine on this end and it melts and fills the drainage ditches along the sides of the trail. 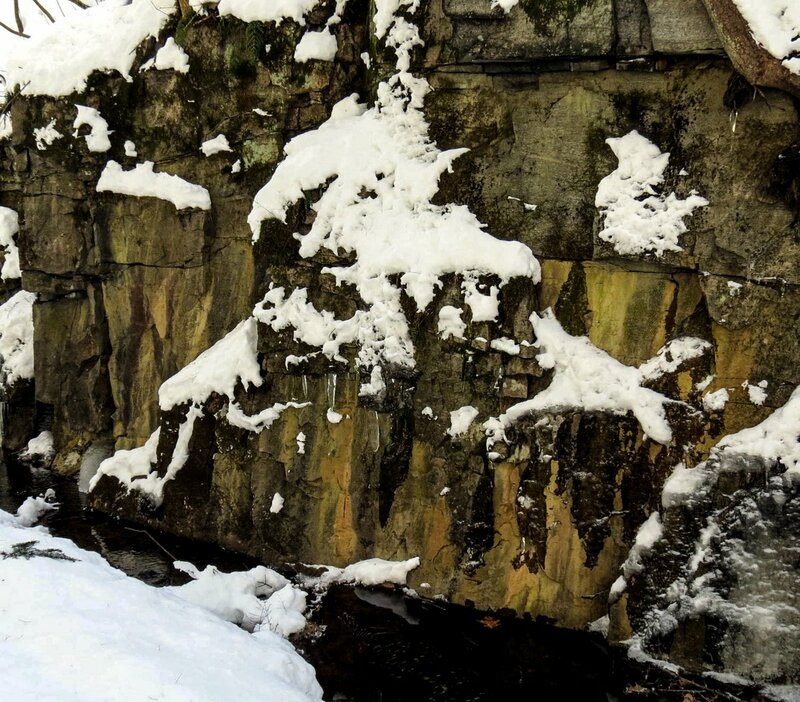 I wouldn’t want to climb down an ice column and suddenly find myself standing in two feet of freezing cold water. 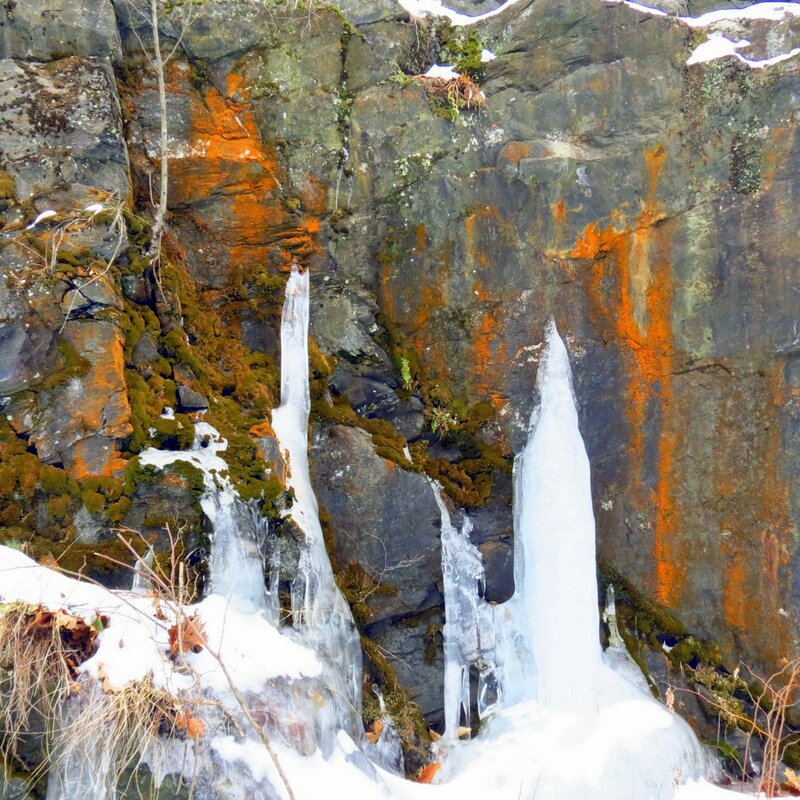 In years past I’ve seen huge ice columns colored reddish orange but this year I only saw those colors in the mineral stained stone. 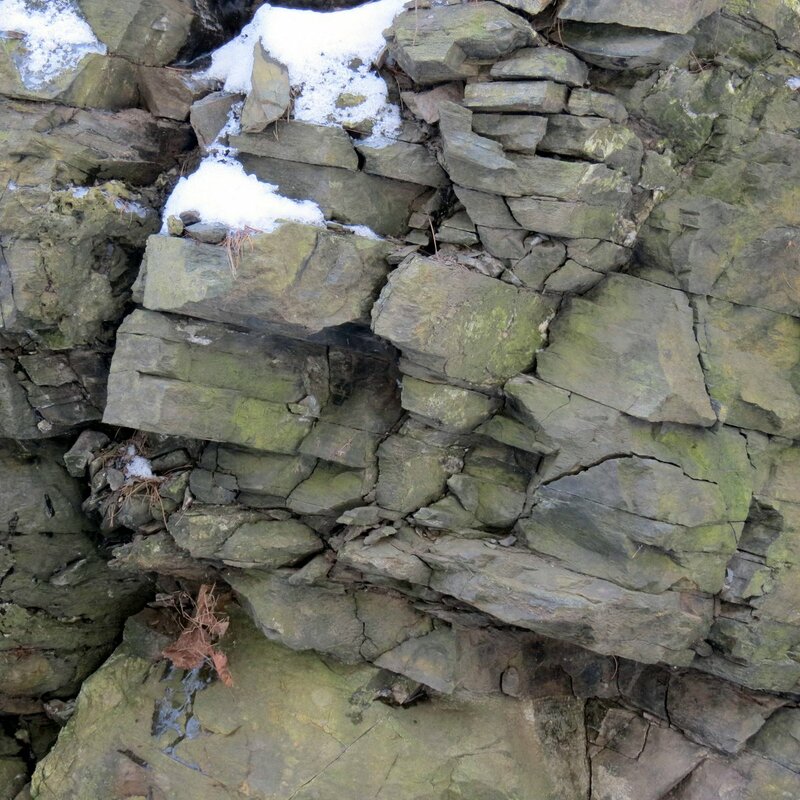 You can see in this photo how the groundwater seeps directly out of fractures in the stone. 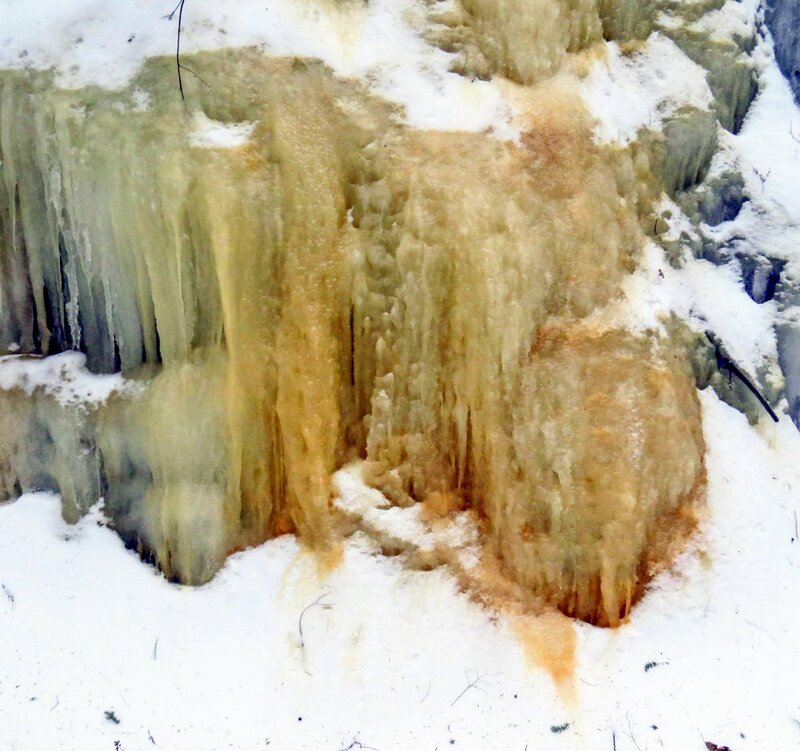 I saw plenty of tan ice that had a few orangey streaks, but no orange ice. 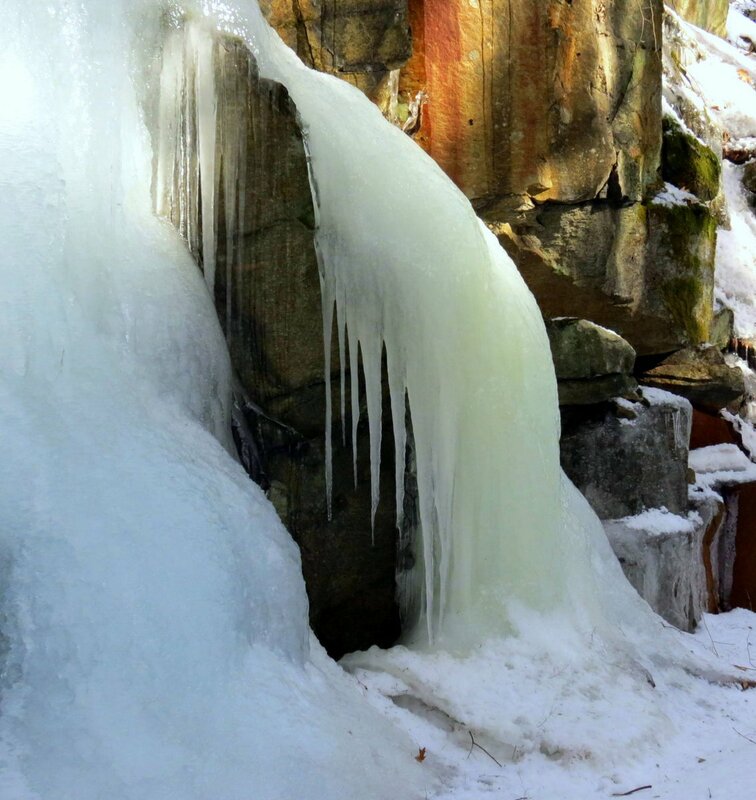 There was so much ice in some spots you couldn’t see the stone that it hung from. 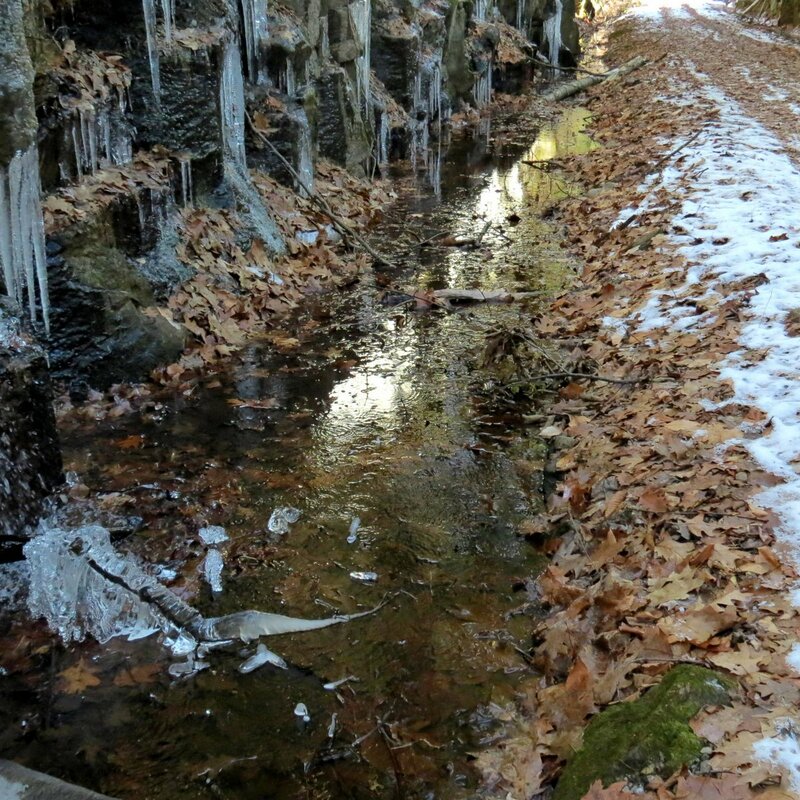 This photo shows the drainage ditches, which are frozen over at times and clear of ice at other times. 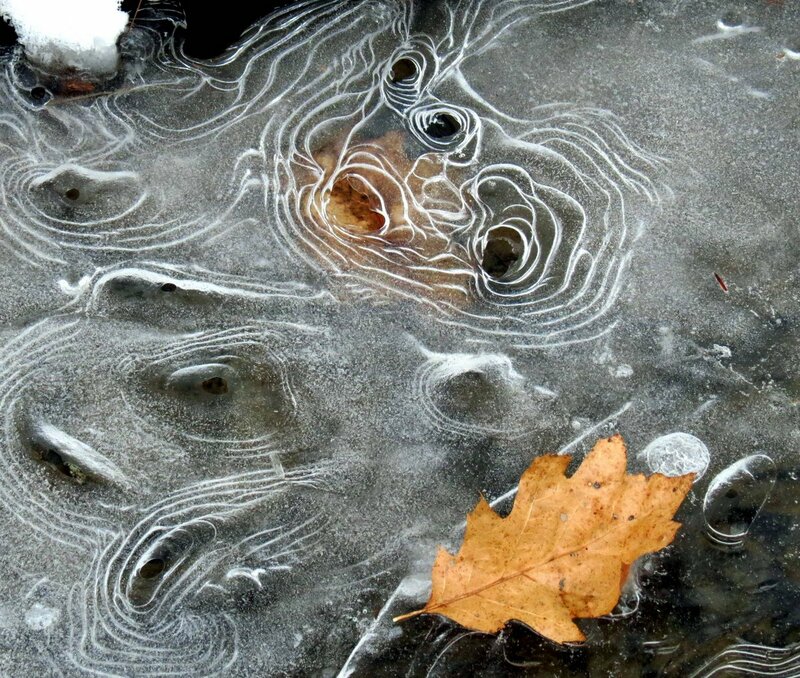 I saw some waves that had been frozen in place. There are small fish in these drainage ditches but they’re very fast so I’ve never been able to get a shot of them. 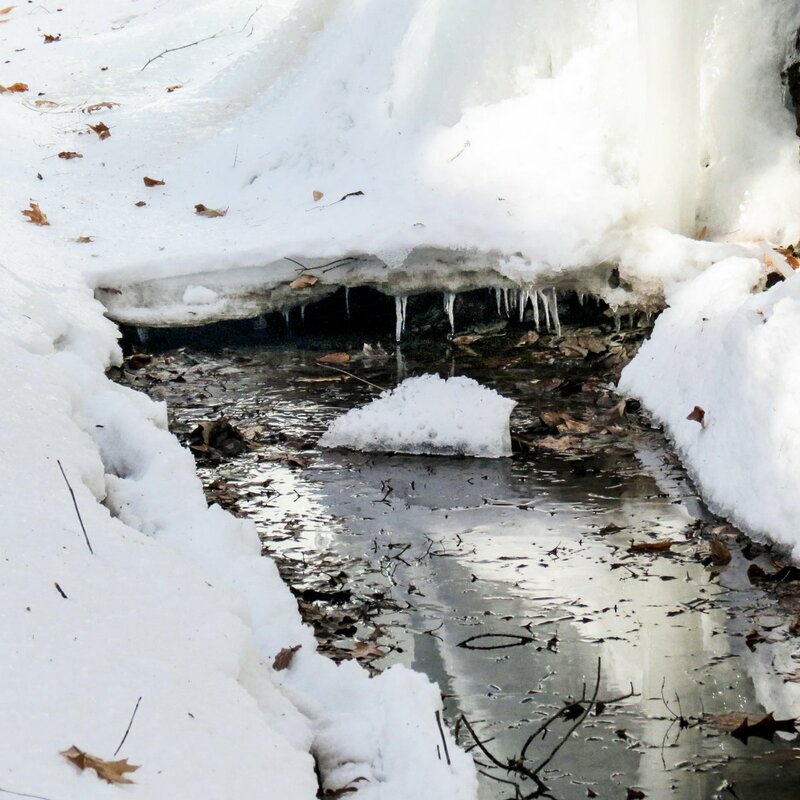 The ice over the drainage ditches is often thick enough to stand on, but you want to make sure you have high rubber boots on if you do. 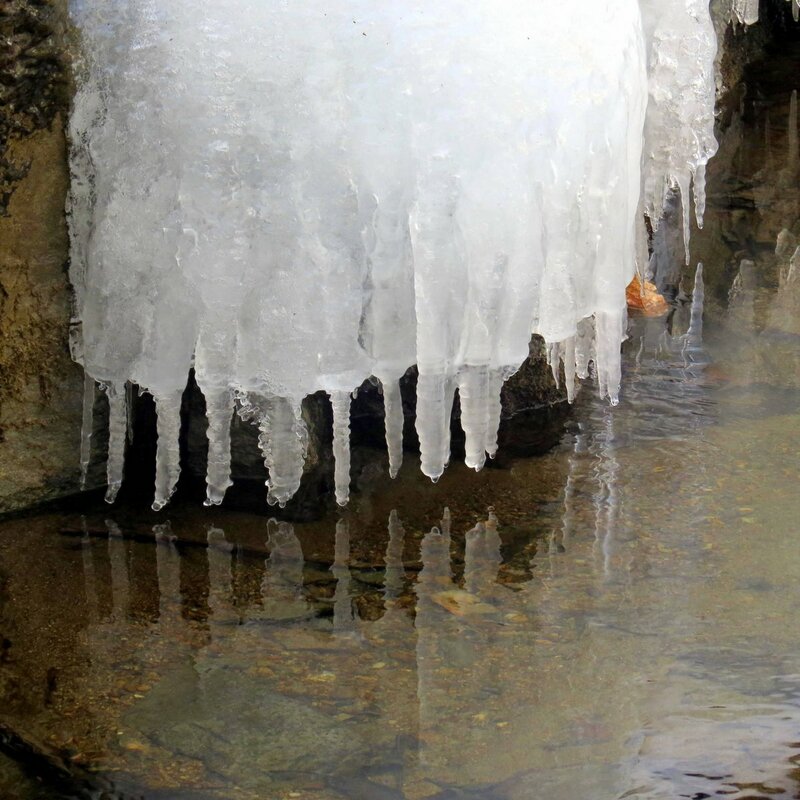 I’ve plunged through this ice before and found myself almost up to my knees in the cold, wet ditch. 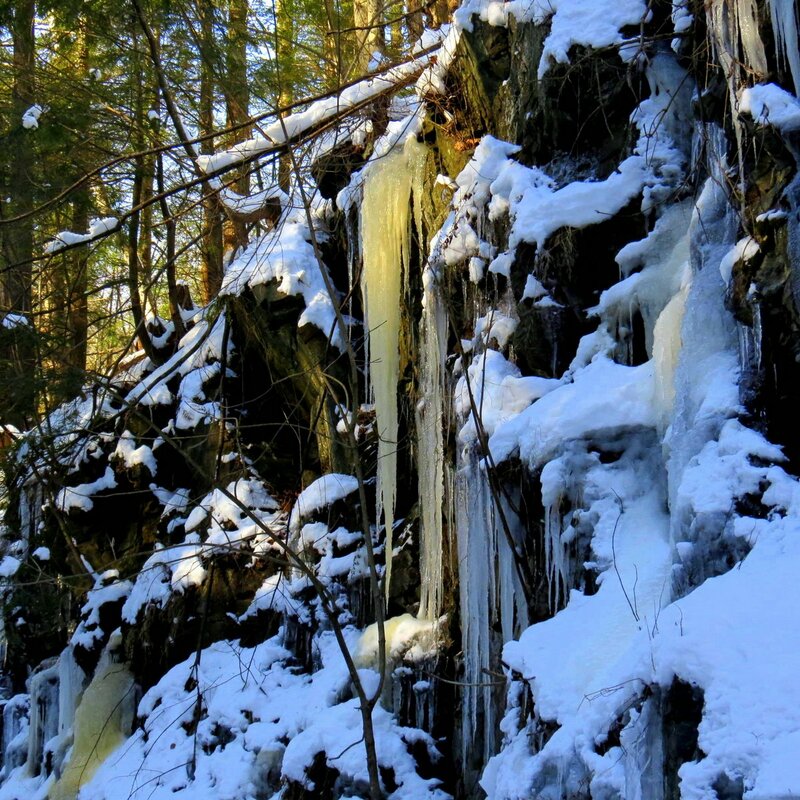 Wherever the water touches the ice columns they melt, and they tell the story of how the water rises and falls in the ditches. 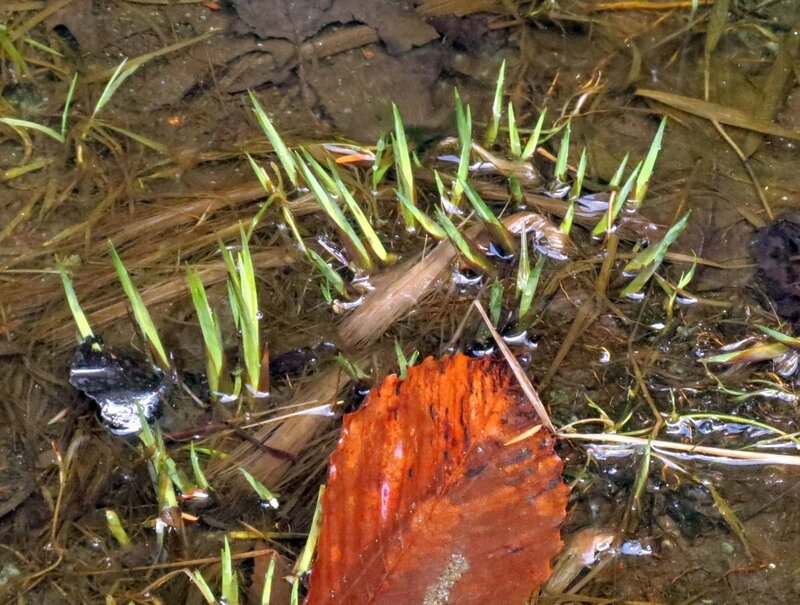 We had a recent day with almost 2 inches of rain and there was plenty of evidence of flooding here. This is one of two places where the water in the ditches rose so high that it washed parts of the railbed away. 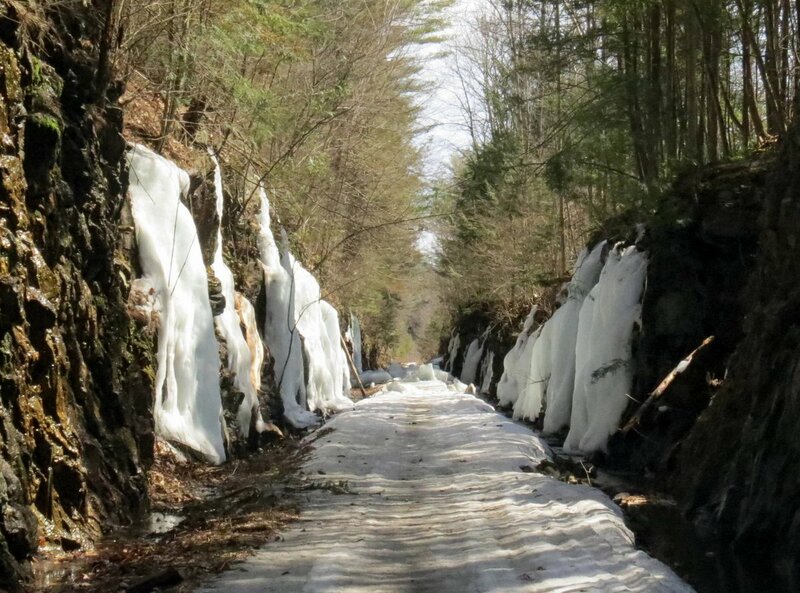 This was disheartening to see because the same thing happened last winter and the local snowmobile clubs had to put in a lot of time and effort last summer to fix it. 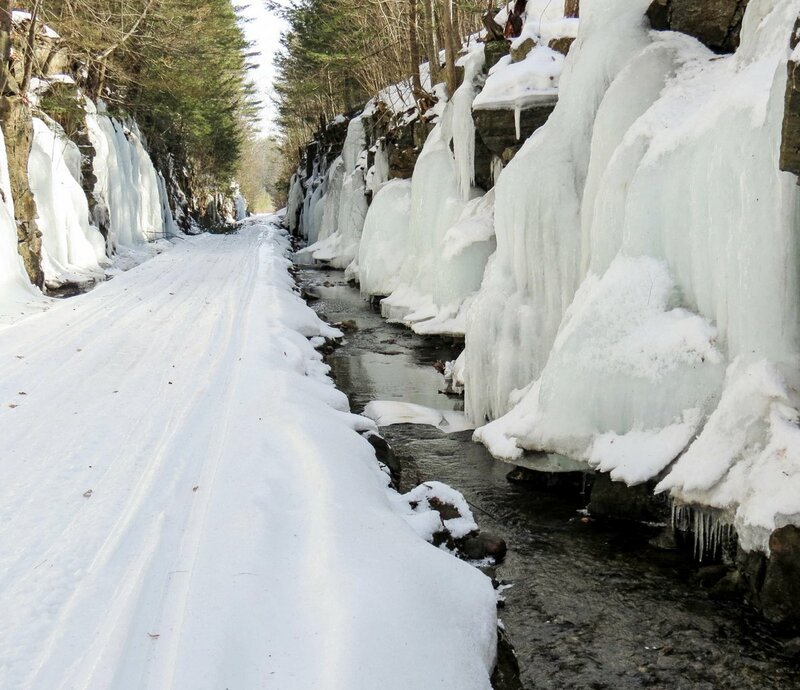 They keep these trails open on their own time with their own tools without pay, and that’s why I always remind people to donate a little to their local snowmobile club, if and when they can. 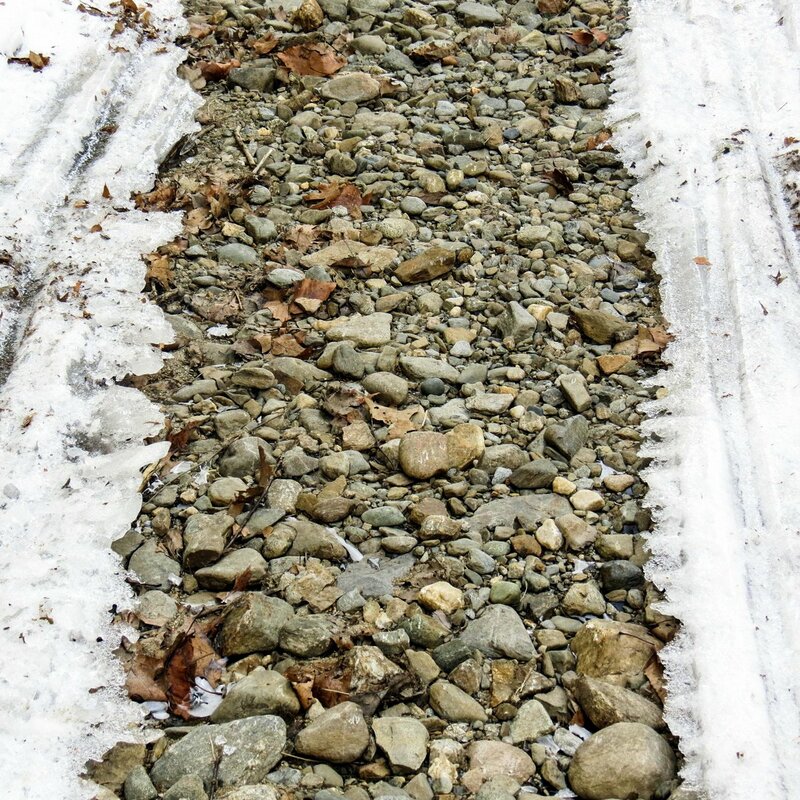 The rushing water scoured away the finer material on the rail bed and exposed the gravel base. 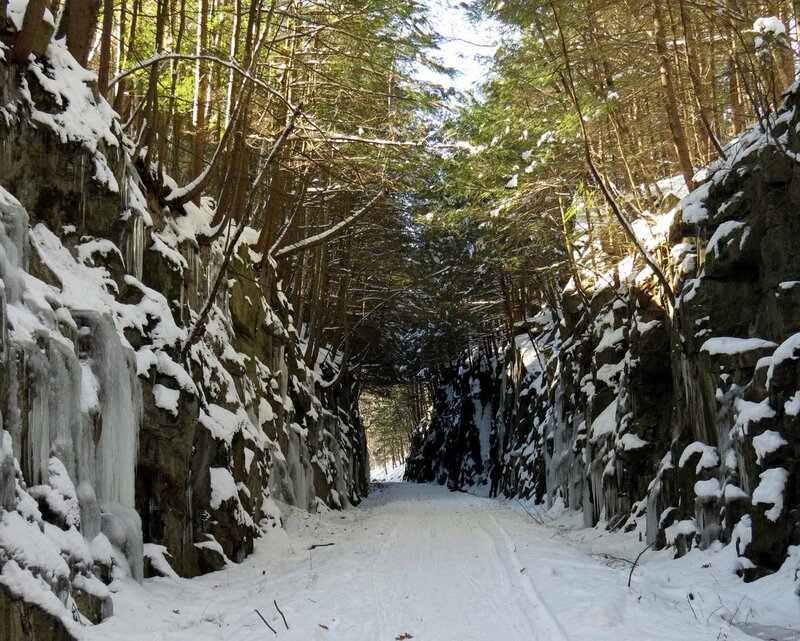 Chances are good that this hasn’t been seen in about 150 years, since the railroad workers put it down. 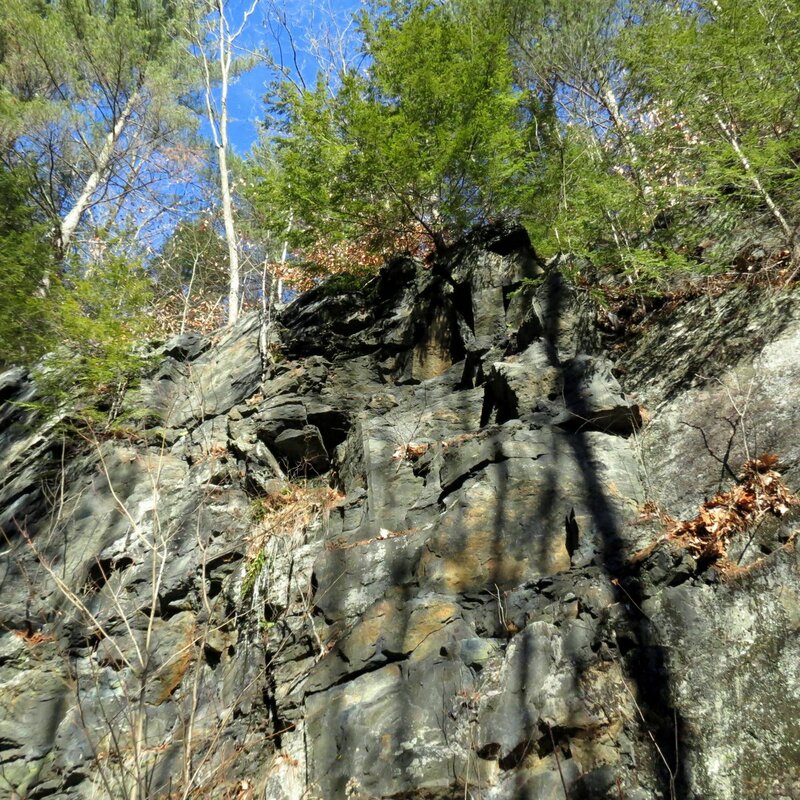 It’s interesting to see that most of this stone isn’t made up of pieces of blasted rock from blasting the canyon through the hillside. These stones are more what I’d expect to see on a river or stream bank. So where did they come from? There must be a very big hole somewhere. I thought I had chosen a good day to come here because it was sunny and approaching 50 degrees. It was a beautiful spring like day but somehow I never gave a thought to the fact that the ice would be melting because of it. 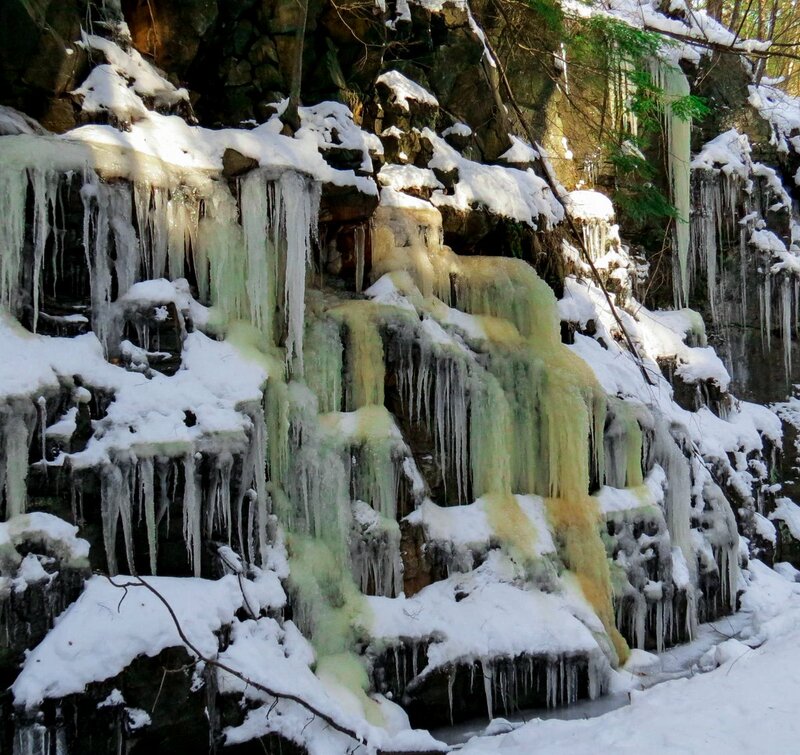 But it was, and in places it was melting fast and falling from the walls. 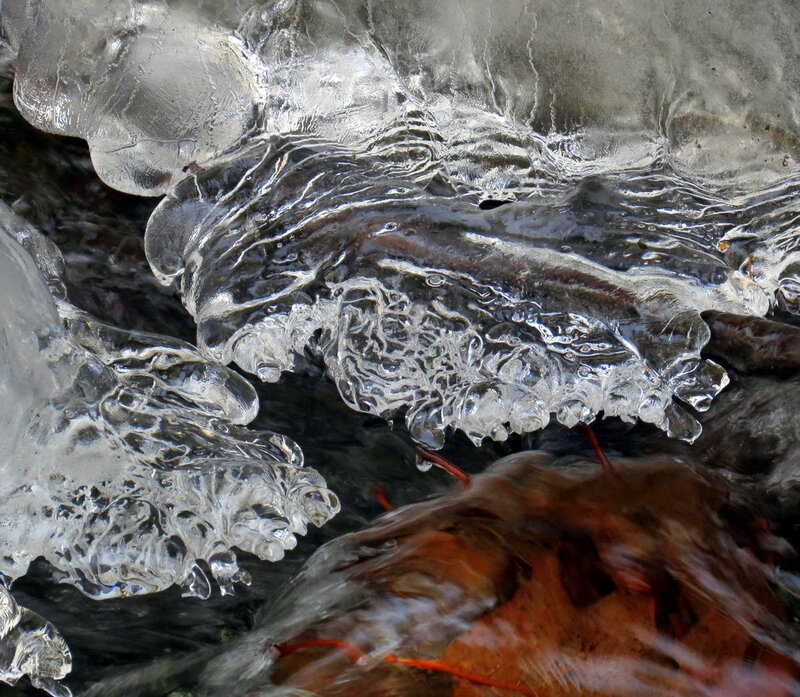 This rotten ice was a sure sign that things were changing due to the warmth. 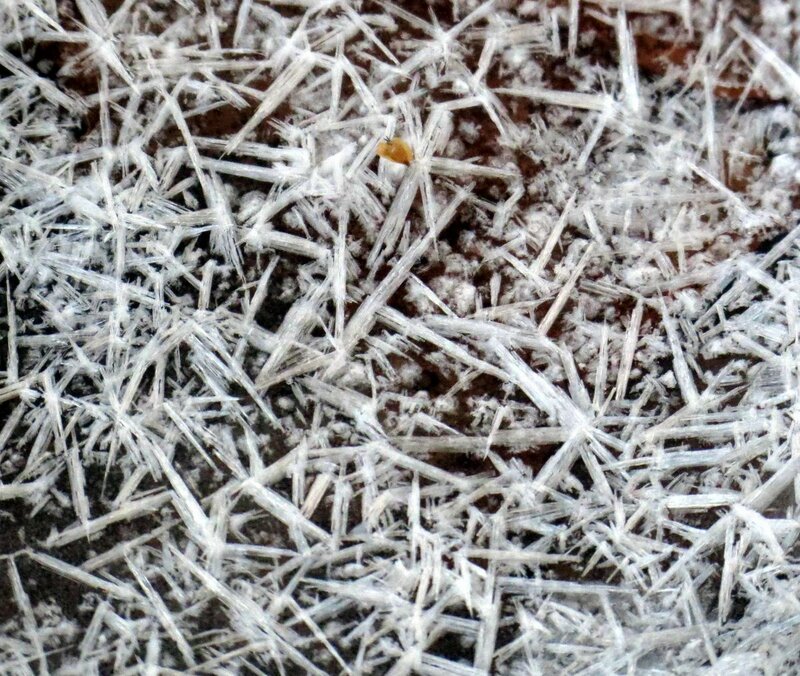 Ice is rotten when air bubbles or dirt particles get in between the ice crystals and weaken the bonds between them. 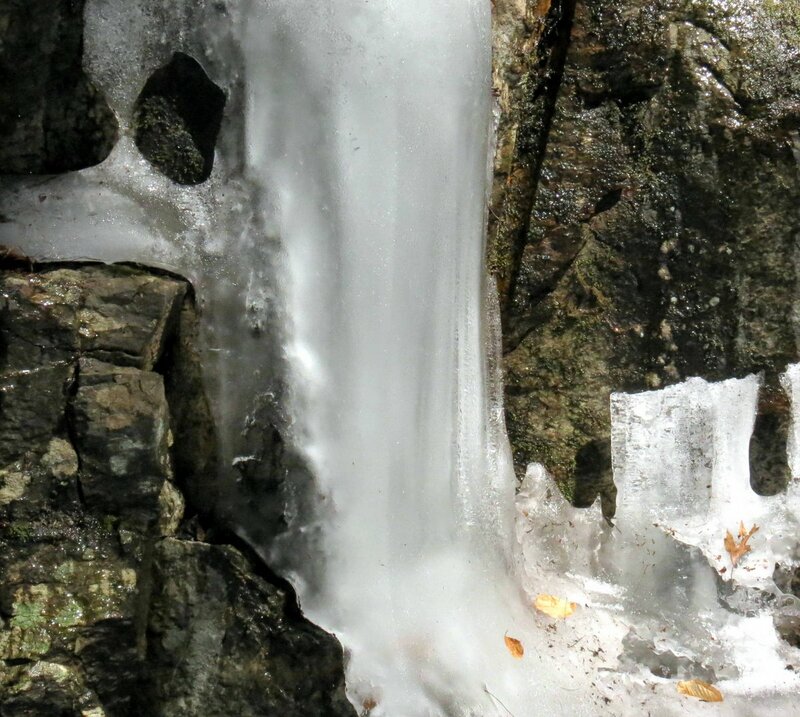 It gives the ice a gray, opaque, “sick” look. When you tap on it you hear more of a thud than a good ringing rap. This wasn’t good and it convinced me that I’d better get out of here, because an ice column had fallen and reached the center of the trail. 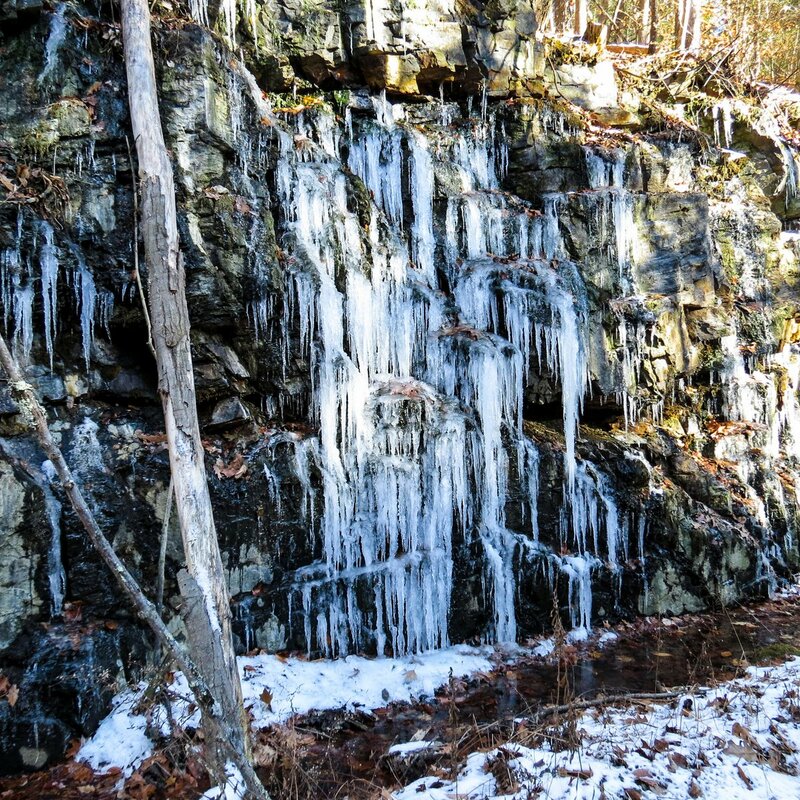 I always walk in the center of the trail, thinking that if ice ever fell it would never reach me. So much for that theory. 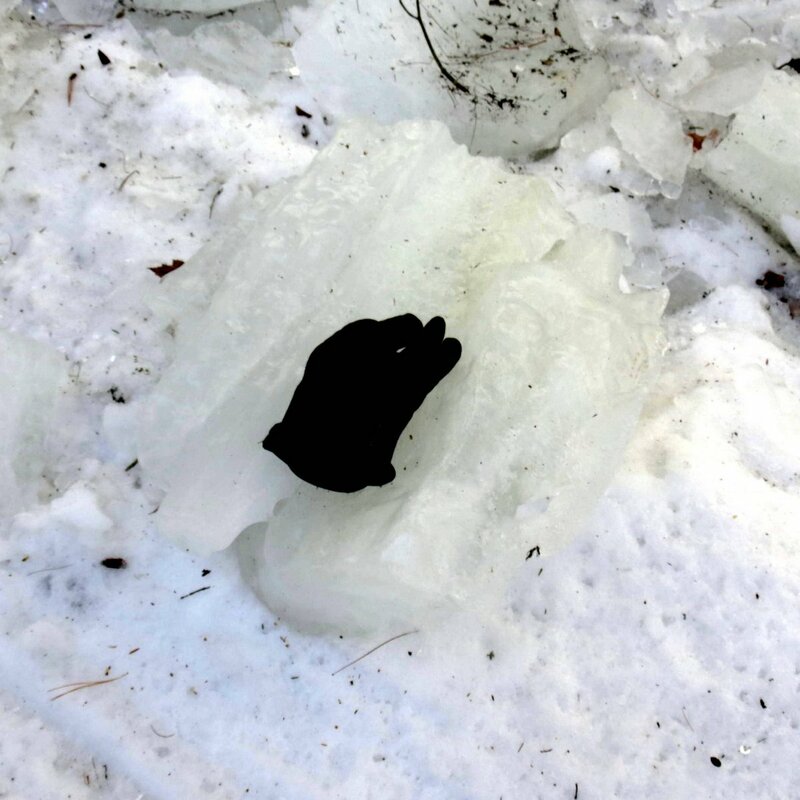 I put a glove on one of the pieces of fallen ice column to give you an idea of how big they were. They were easily big and heavy enough to crush and kill if they ever fell on someone. 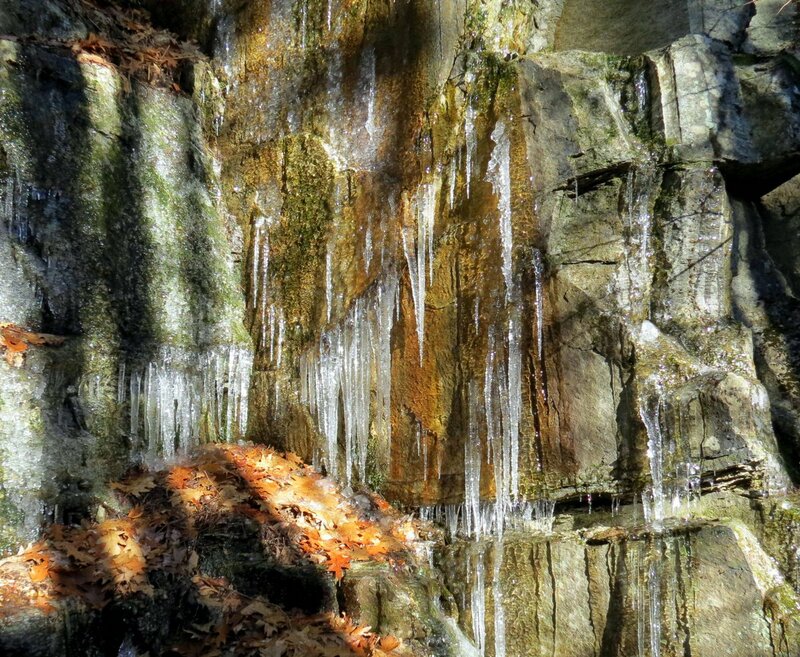 All of this freezing and thawing takes its toll on the ledges and stones fall from these walls too. 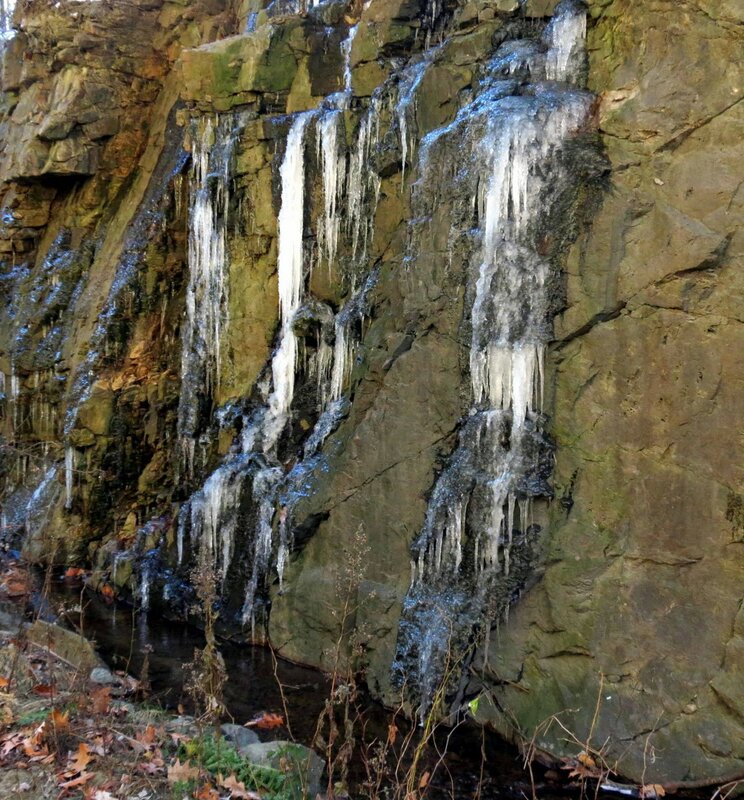 The water gets into the cracks in the stone and expands when it freezes and shatters the stone, as can be seen in this photo. Stones big enough to crush cars have fallen from the walls in the past. I hope I’m not here when the next one comes down. 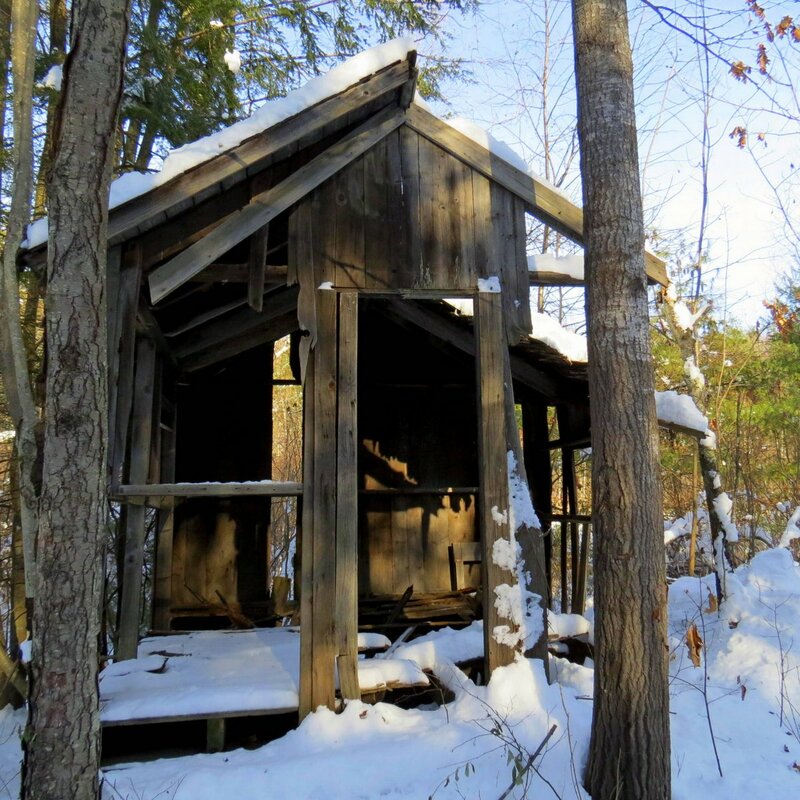 As I always have I stop and stand in awe of the old lineman’s shack which, even with one wall and half its roof gone still stands. It’s slowly getting worse though and I doubt it will make it through one more winter. 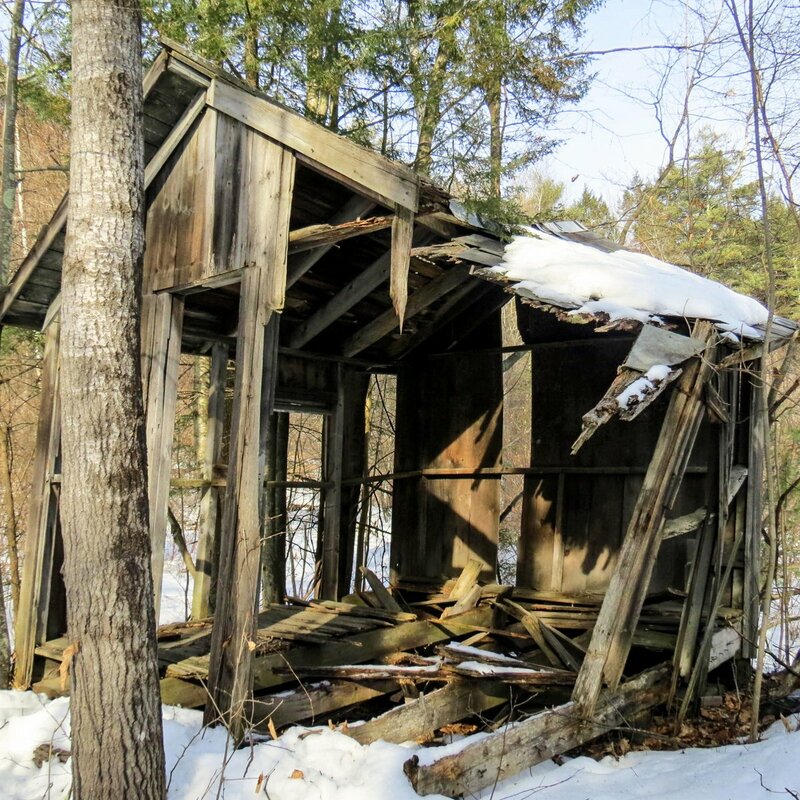 I often wonder if they stored shovels in the shack so they could shovel out this canyon when it snowed. 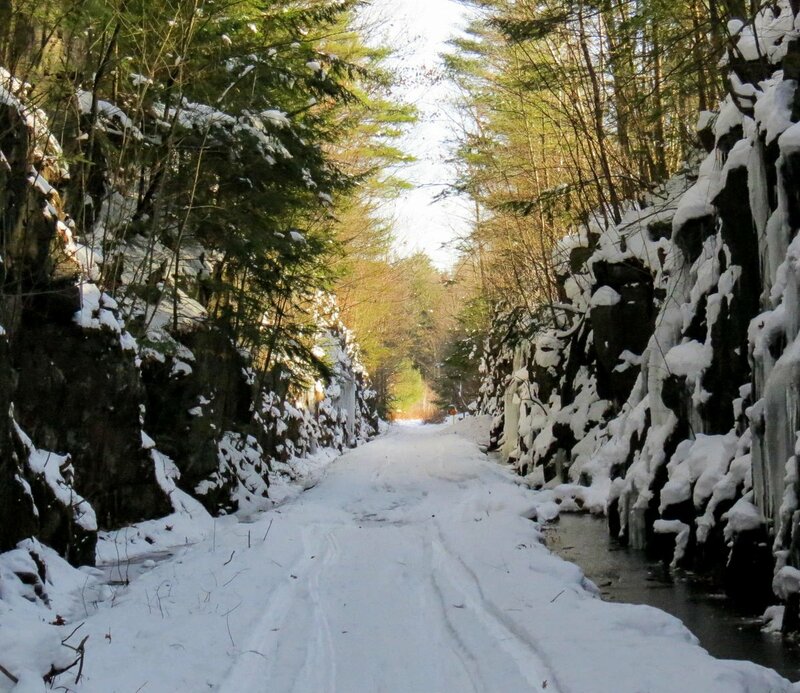 I’ve seen photos of train locomotives with big plows on them but where would they plow the snow in a canyon barely as wide as the train was? 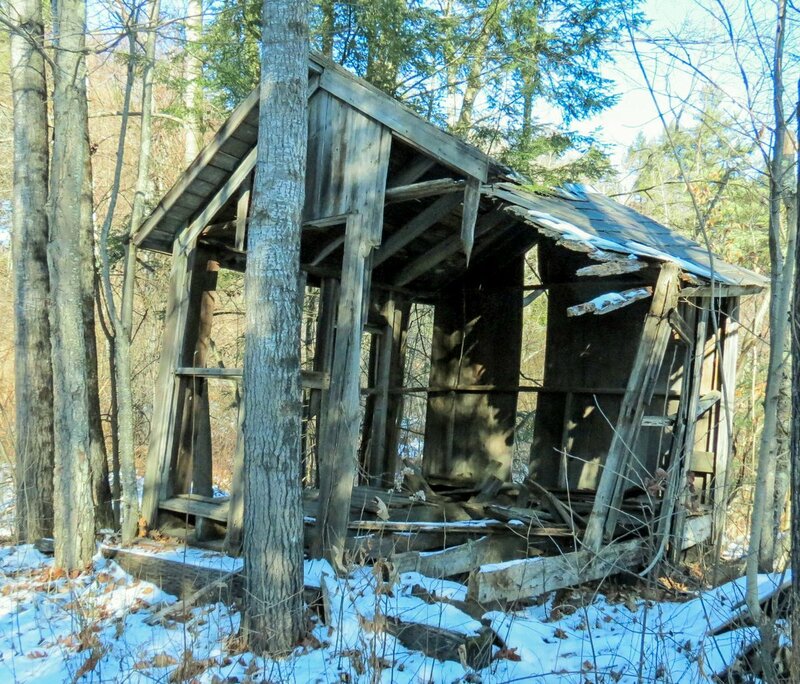 I think they must have had to shovel it, at least some of it, and I can’t even imagine what back breaking work that must have been. After one last peek at the ice climbers my time here was done. 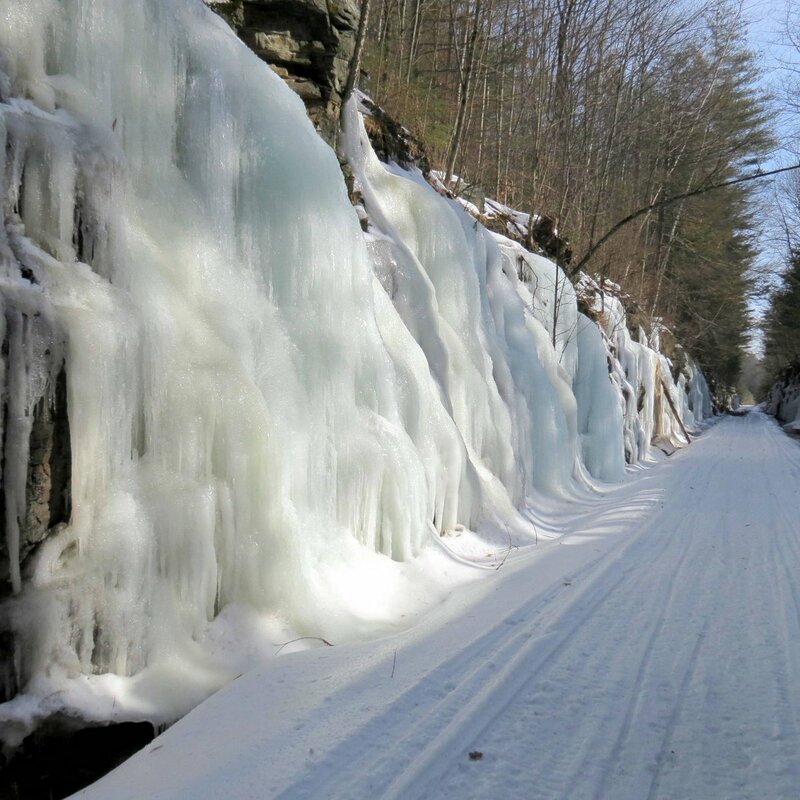 We’ve had some cold nights and a little snow over the last week or so and it seems like winter might be here to stay, so I decided to visit the deep cut rail trail in Westmoreland recently. 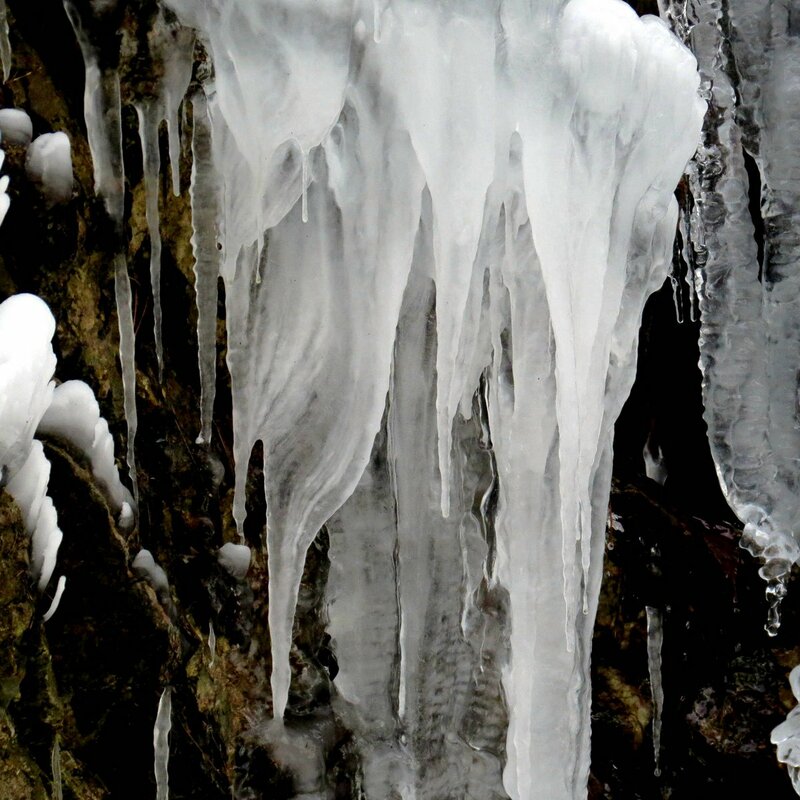 Once the cold settles down inside this man made canyon it’s reluctant to leave, and spectacular ice formations grow here. 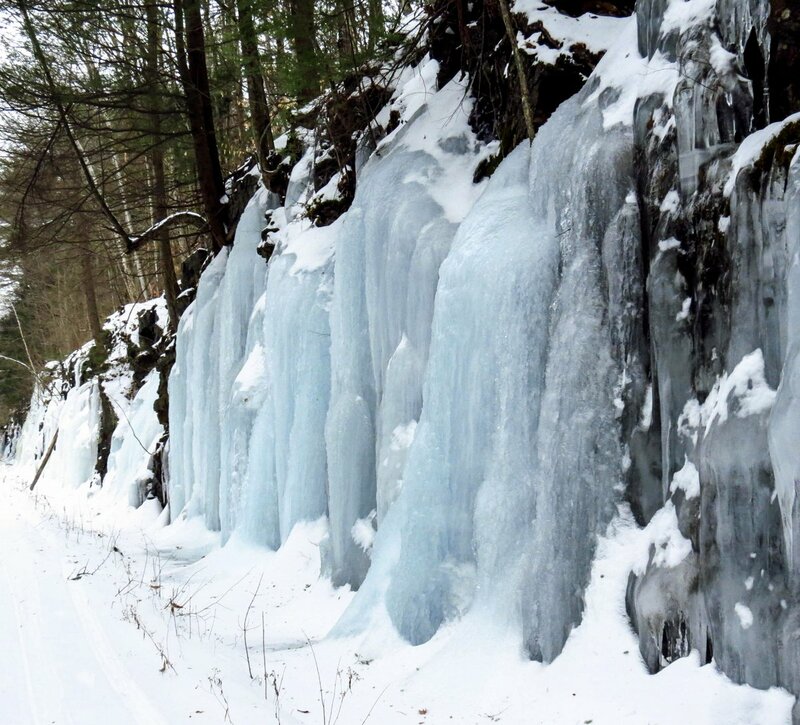 The ice is fueled by the groundwater that constantly seeps through the bedrock that the railway workers hacked their way through in the mid-1800s, and ice columns as big as tree trunks are commonplace. 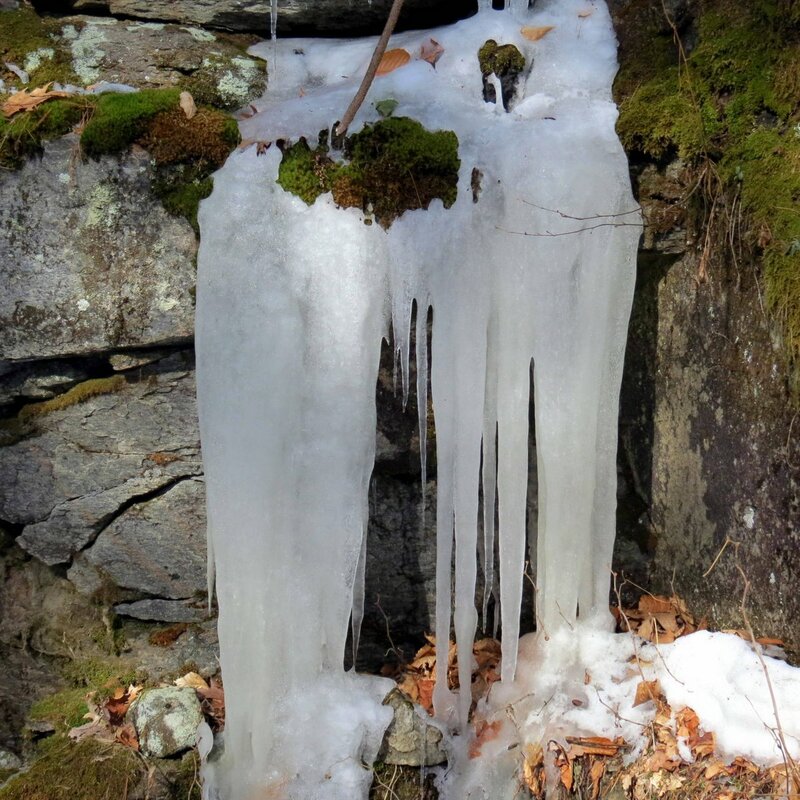 I’ve seen huge ice columns here many times but I’ve never seen their birth, so that was the object of today’s hike. 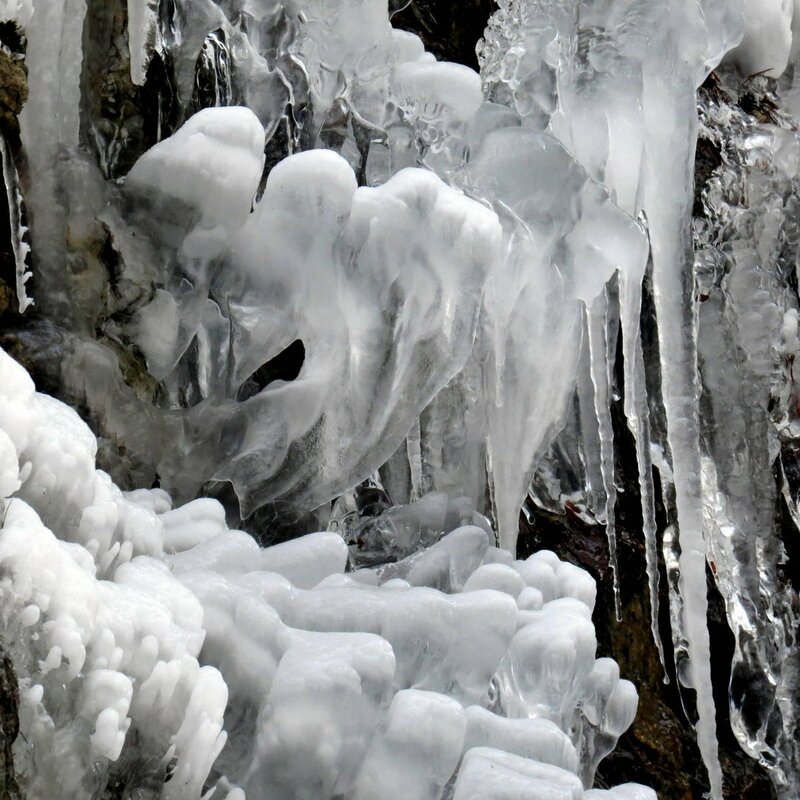 Ice was forming almost everywhere on the vertical walls of the canyon. 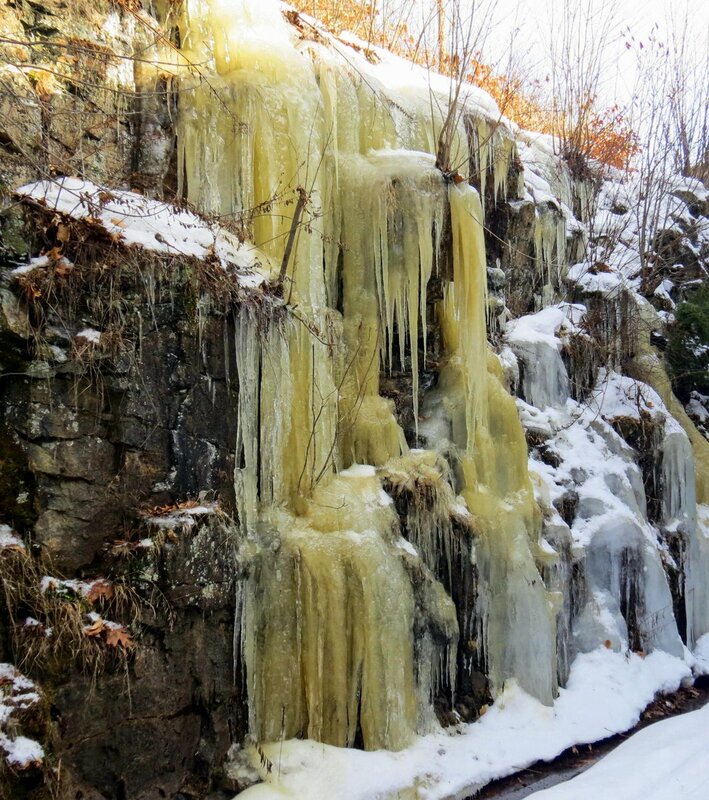 It was very cold this day and even in the bright morning sunshine the ice wasn’t melting. That’s the secret of the why the ice grows to such giant proportions here; the temperature seems to stay about 10 degrees cooler in both winter and summer. On a hot July day the natural air conditioning is very welcome, but in December it can be like walking into a freezer so you had better be dressed for it if you plan on spending much time here. 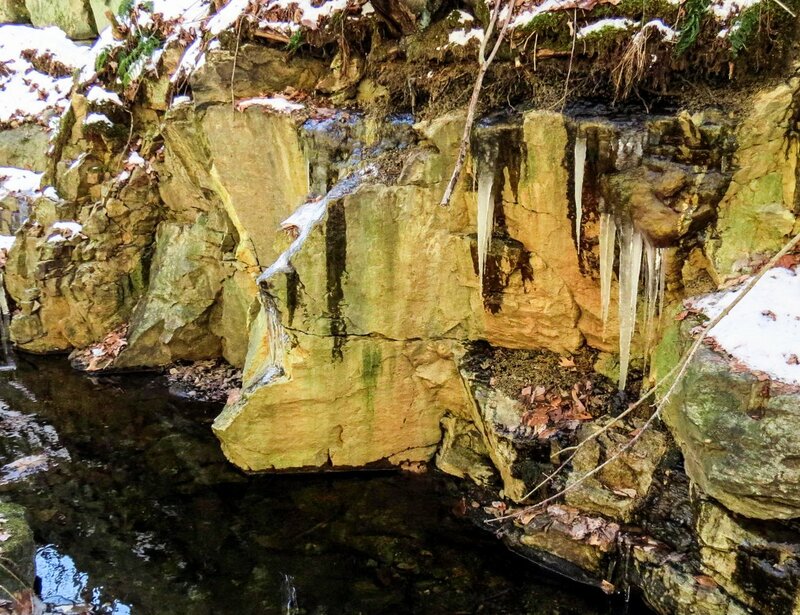 The groundwater seems to follow the natural lay of the stone and seeps between the layers winter and summer. 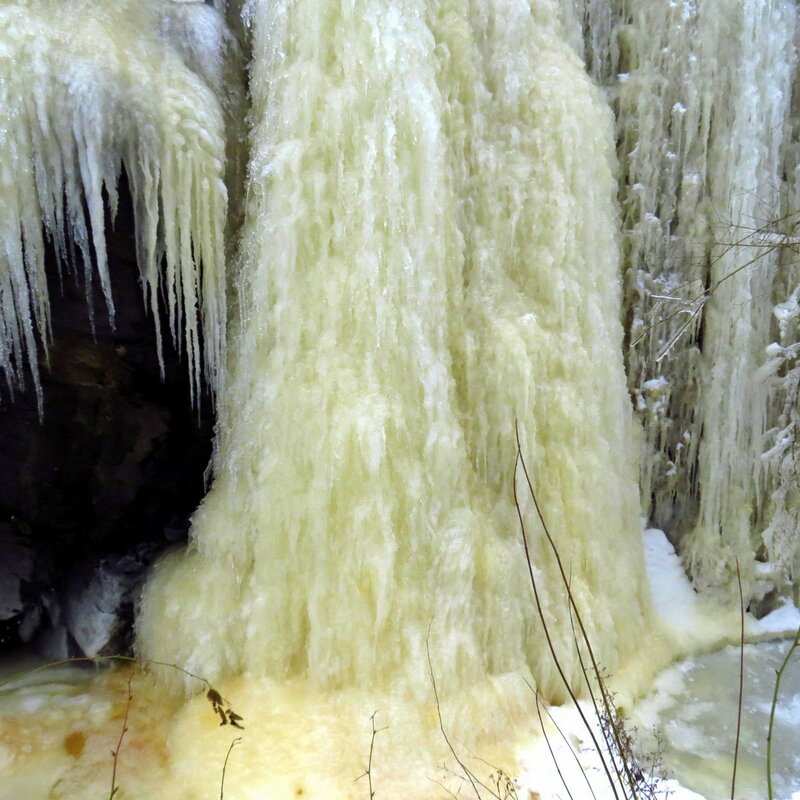 The water doesn’t seem to ever stop seeping so when an icicle forms more and more water flows over it, increasing its length and girth drip by drip. 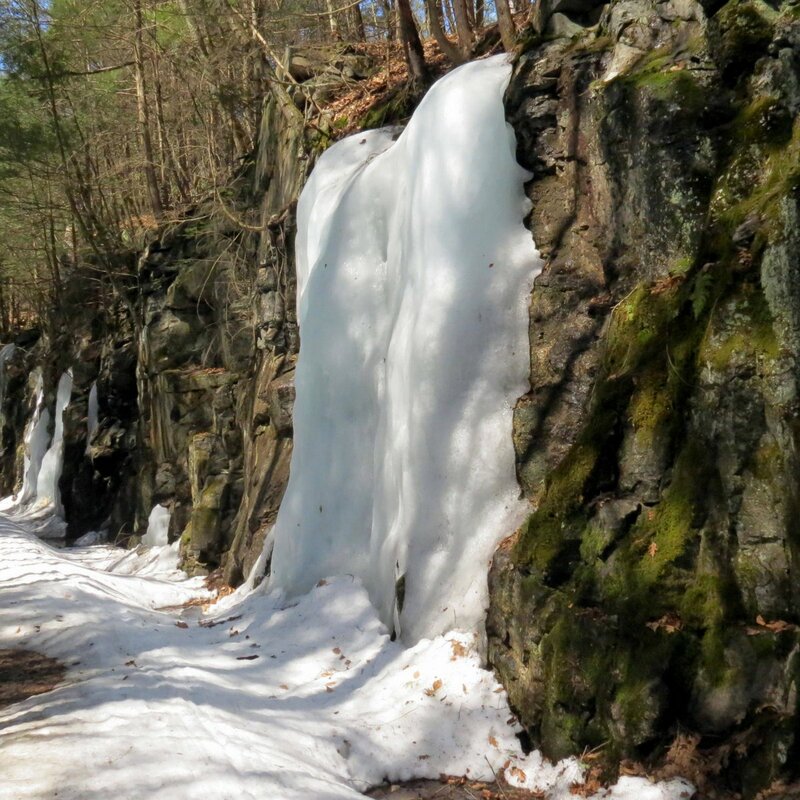 There can be enough ice here in February to cover the stone ledges completely in many areas. Unless you’ve seen them the ice formations are hard to imagine, so I’ve used this photo from last February to better illustrate the size of both the ice and the place. 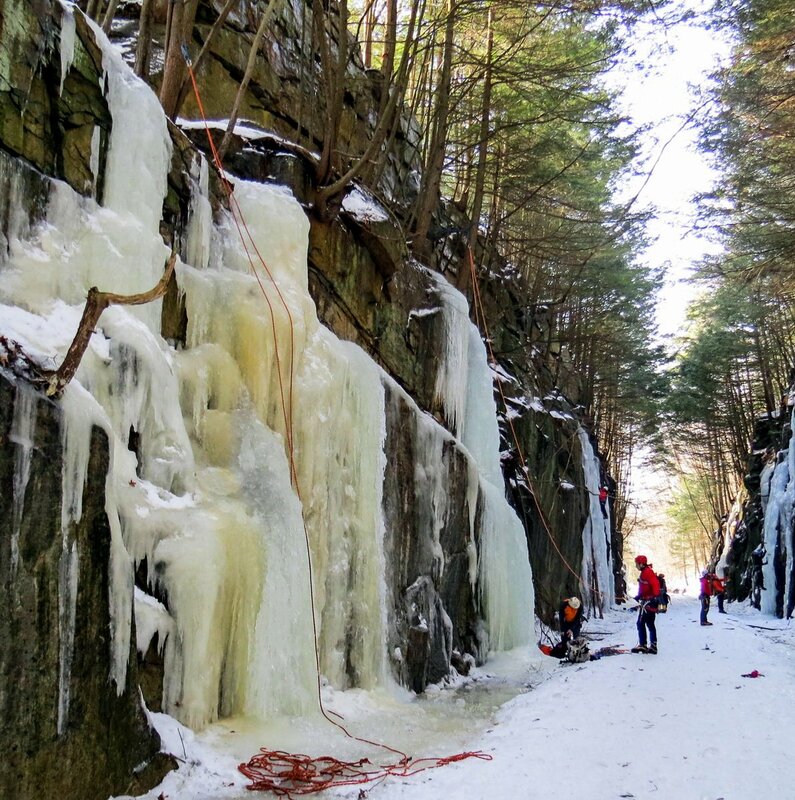 Last winter was mild so the ice shown is tame in comparison to previous winters but still, ice climbers came to train. 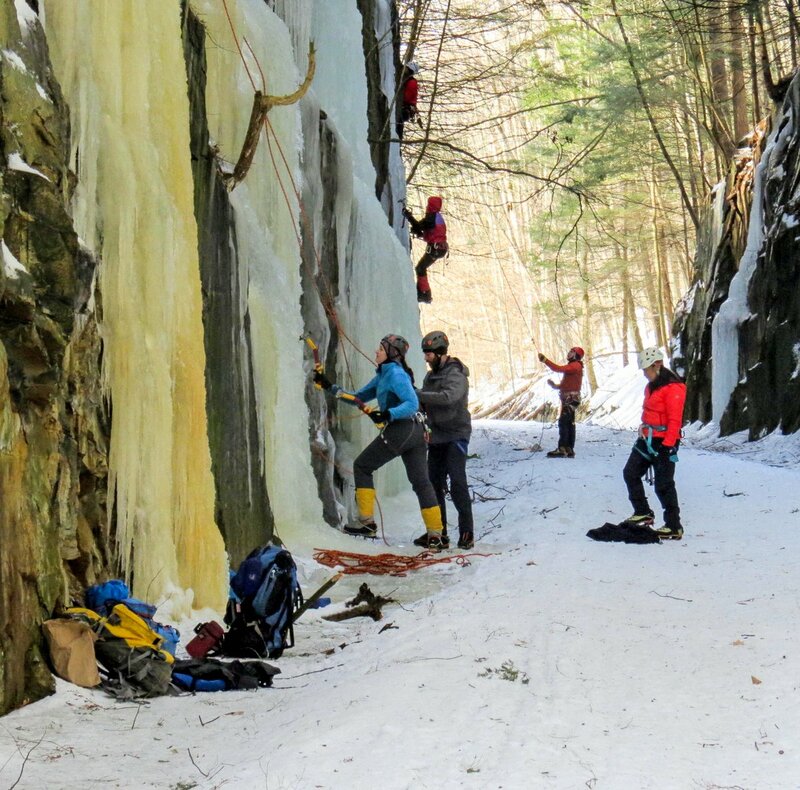 The New Hampshire branch of the Appalachian Mountain Club holds regular ice climbing clinics here and seeing climbers on the ice is fairly common on weekends. I expect that I’ll see a few this winter. There is almost always the sound of water dripping here. Usually it comes from the seeping groundwater but in at least one spot water gushes through a rift in the wall with enough force to be called a stream. I wonder if a stream on the hillside above somehow changed course, because I doubt that the railroad engineers would have left it this way. All that water has to go somewhere so the railroad built drainage ditches on either side of the railbed to direct it where they wanted it to go. 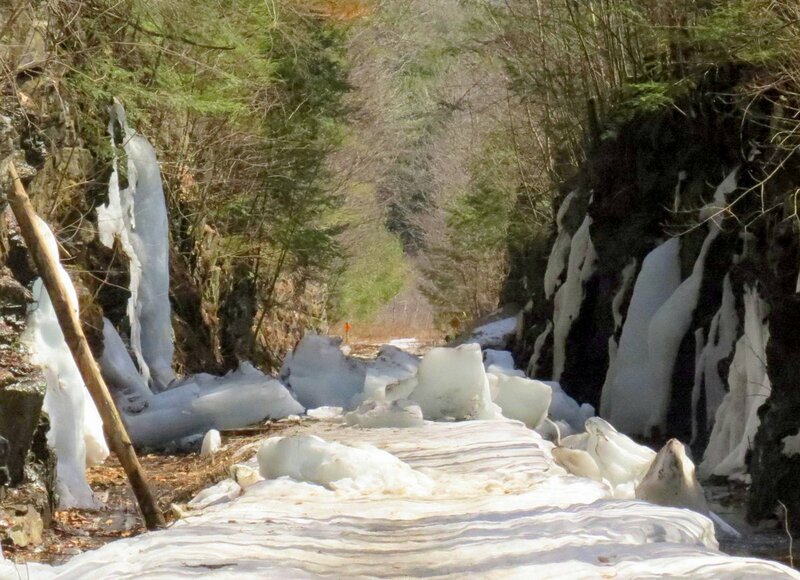 The ditches have kept the railbed dry for over 150 years but I saw that a rockslide further down the trail had dammed up one side and now water is washing away the railbed. 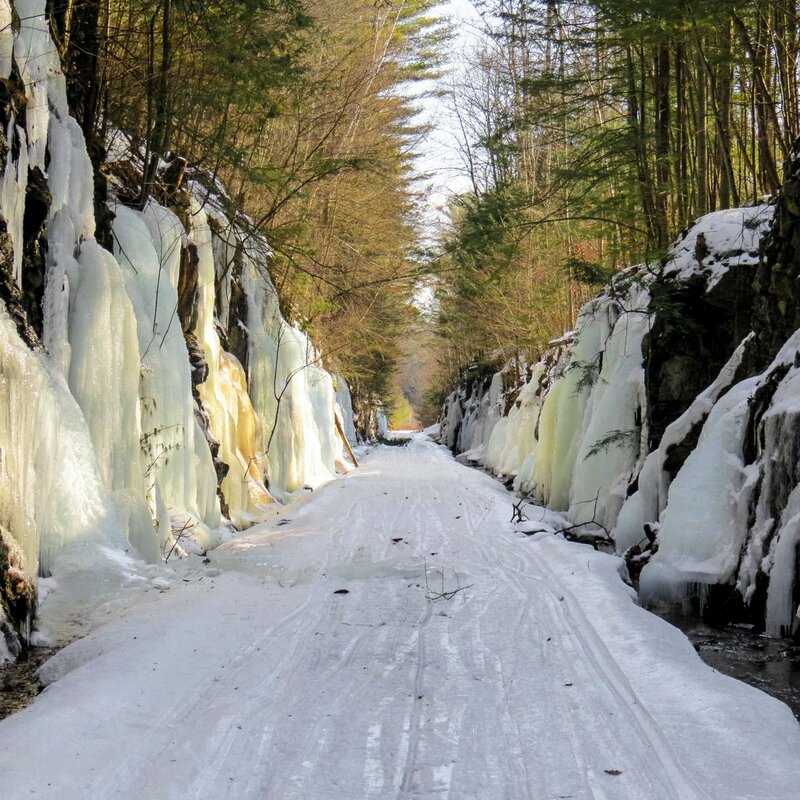 With no railroad to maintain these rail trails it’s now up to private groups like snowmobile clubs to do all the work. They do a great job but it they might not be aware of the washout. 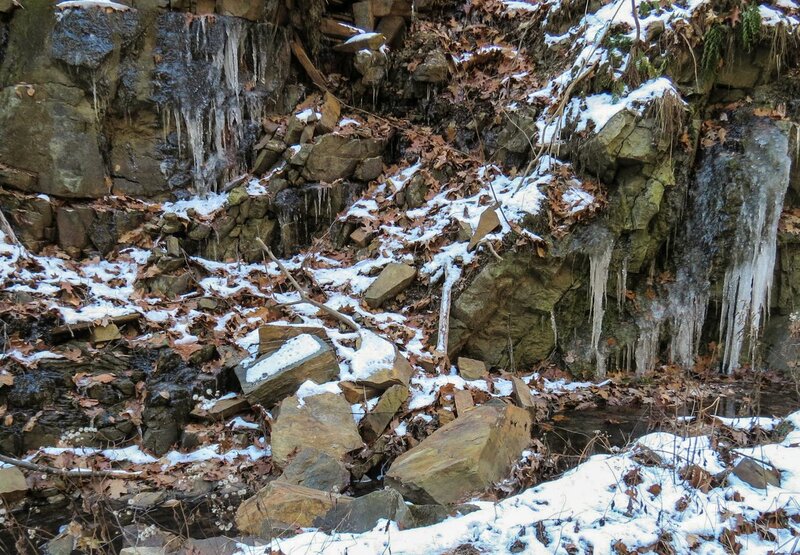 This is a shot of where the rocks have fallen across the drainage ditch and dammed it up. 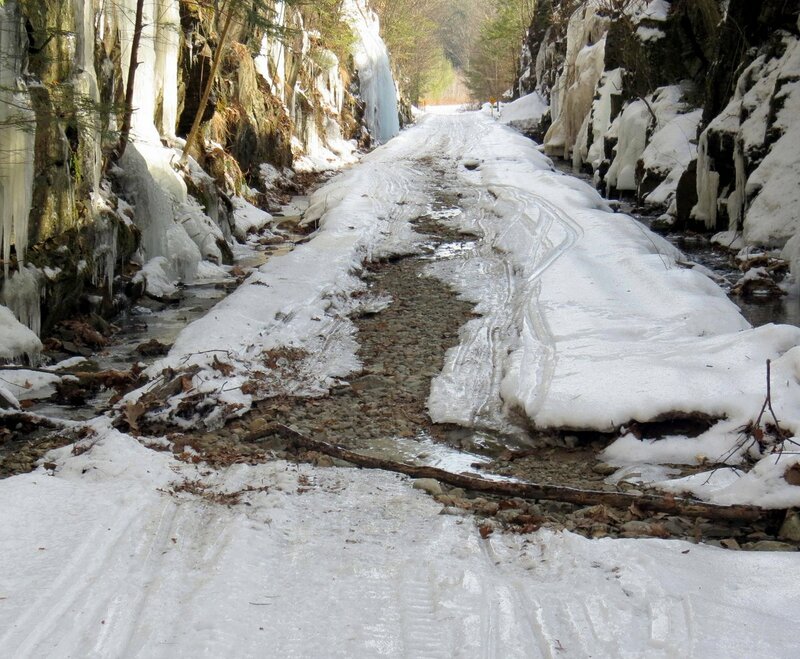 What isn’t seen in this photo is how all the water in the ditch has been forced into the railbed, washing it away. 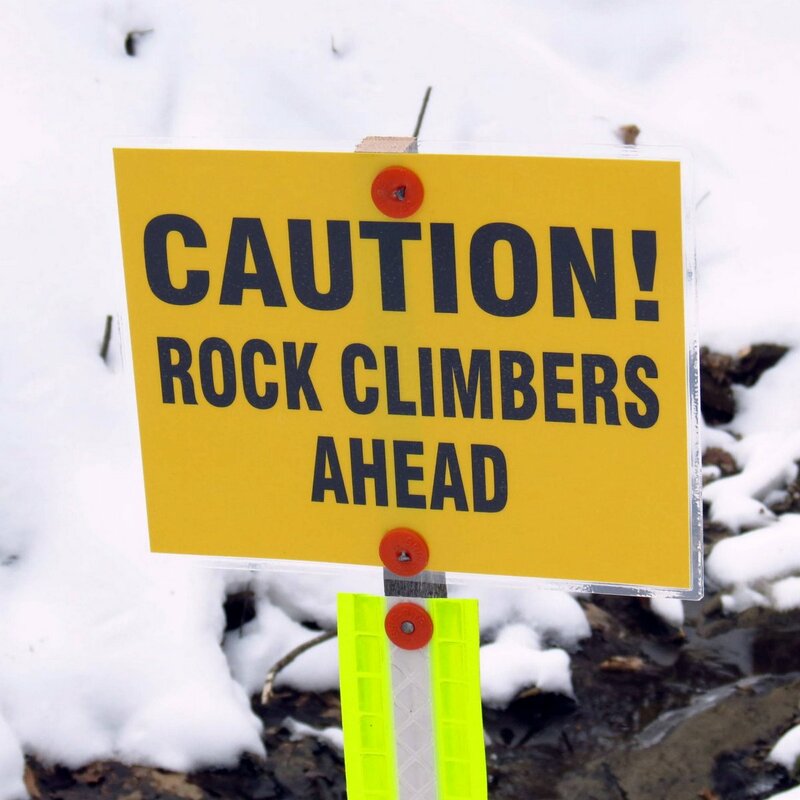 The rocks are big and I’m sure are very heavy but I would think that two men with crowbars could at least slide them over enough to let the water through. 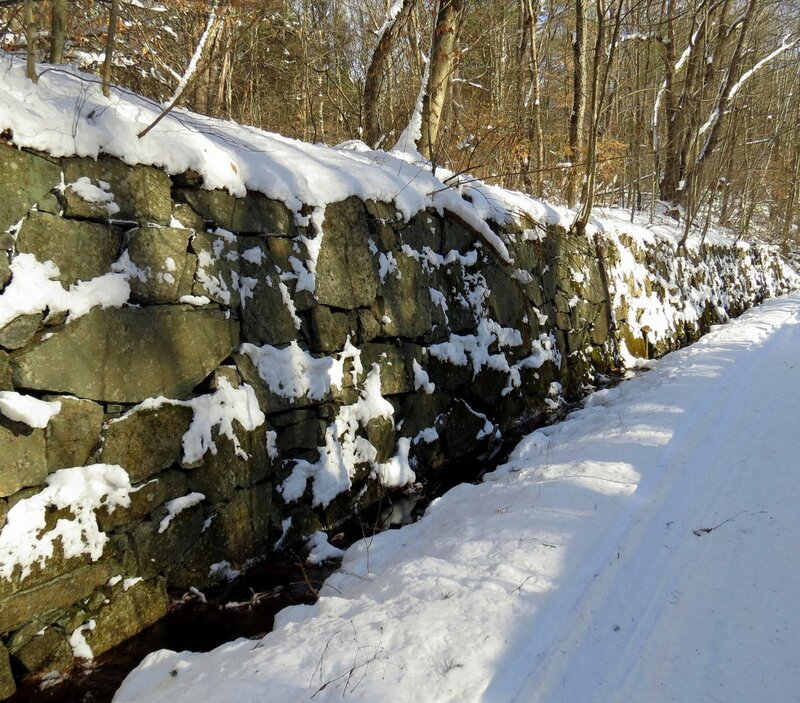 There are many mosses, liverworts, and other interesting things growing on these walls that I don’t see anywhere else so I put on rubber boots and walk across the drainage ditches to get close to them. 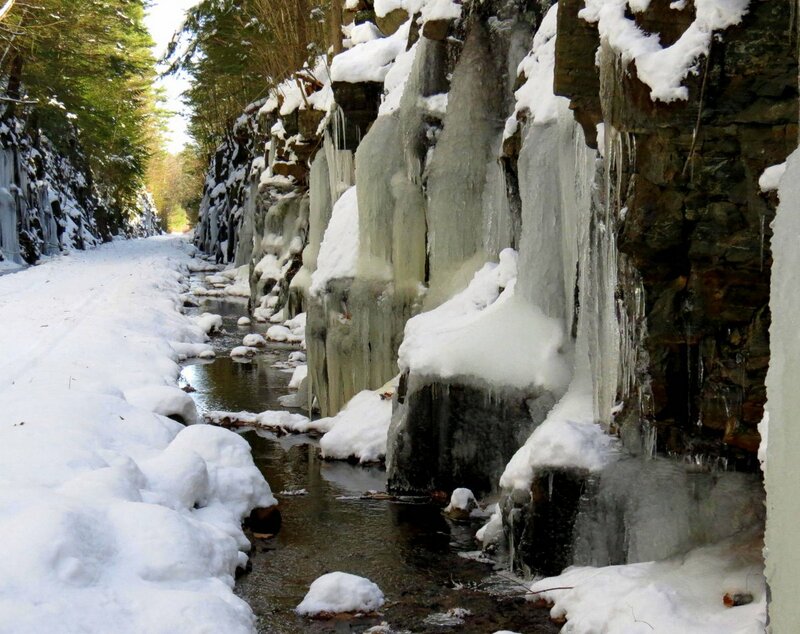 I’ve seen large stones that have fallen into the railbed and in the winter falling ice is always a possibility, so I have to be very aware of what’s going on around me. I always look up before I cross a ditch to get to a section of wall to make sure that I’m not going to be standing under overhanging ledge like that seen in this photo. 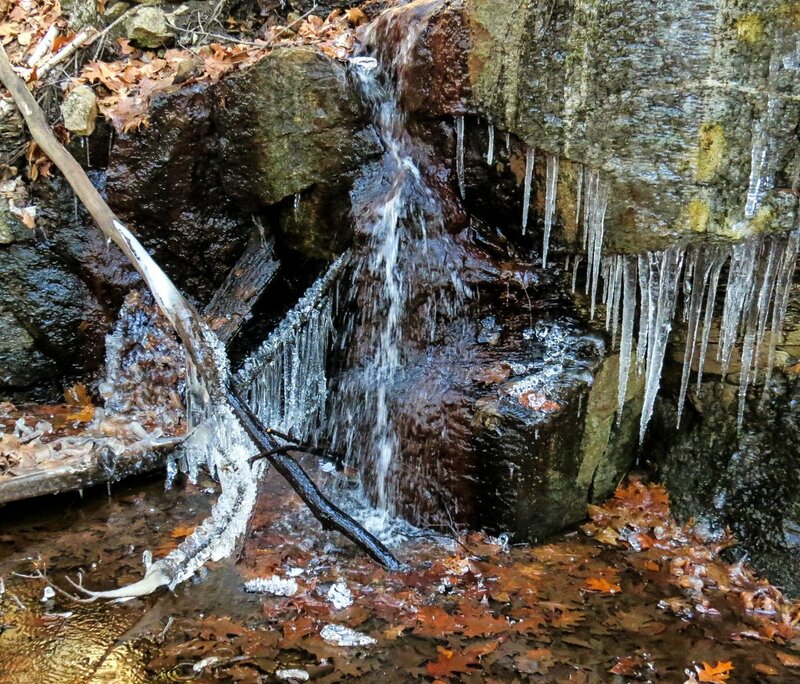 I’ve never seen one fall but fallen stones litter both sides of the trail all down its length. For me this is what makes coming here worth any small amount of risk involved; I can get close to so many plants that I’ve never seen before, like the great scented liverworts (Conocephalum conicum) seen here. They are very particular about where they grow, insisting on just the right amount of light, humidity and temperature and they have found the perfect spot here, where they grow in great numbers. Though they are said to be common I never see them anywhere else. 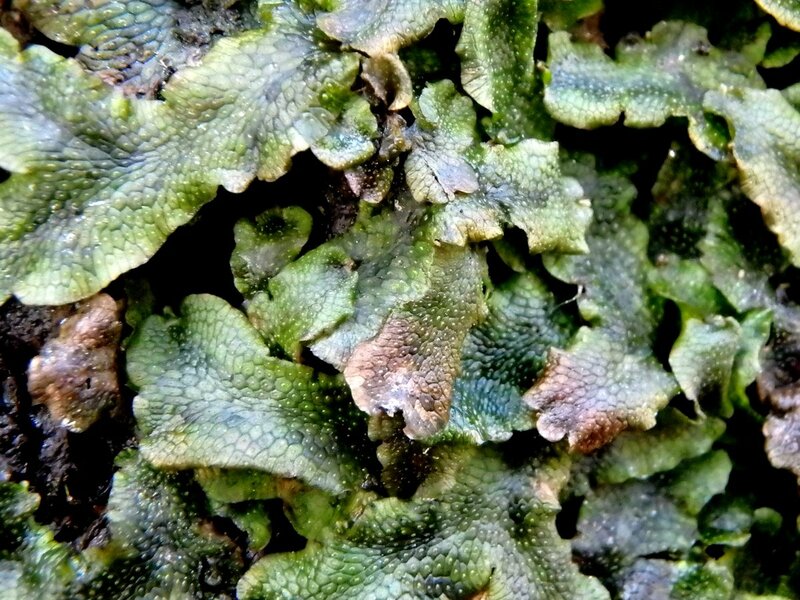 The great scented liverwort is also called the snakeskin liverwort, and with good reason. I love its reptilian skin and its scent, which is so clean and fresh it always makes me wish it came in a spray bottle when I smell it. Each more or less hexagonal leaf cell has a central pore over the top of an air chamber. On the floor of the air chamber are photosynthetic filaments called chloroplasts, and the pores through its skin let in enough light for the chloroplasts to do their work, which is photosynthesis. It’s quite amazing, as is all of life. 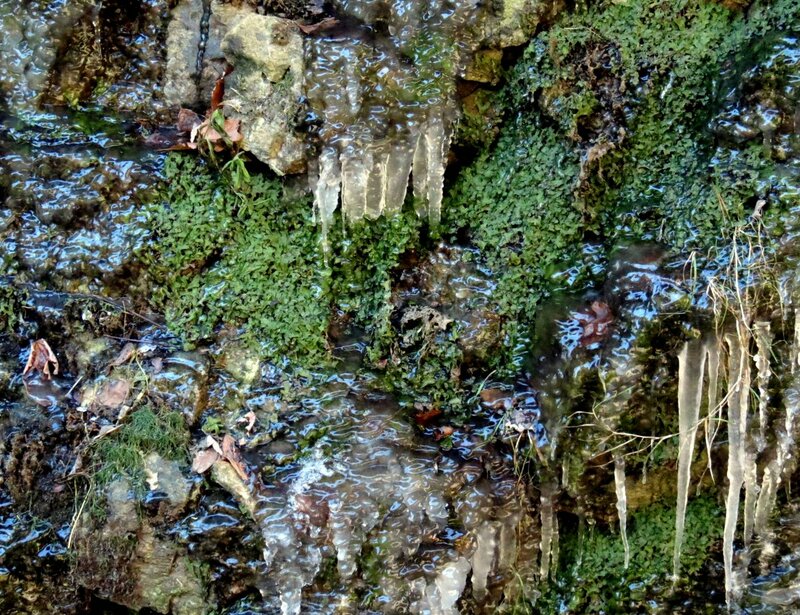 Though the liverworts might seem fragile they are actually very tough as all of the plants that grow here have to be, because they are often completely encased in ice throughout the winter months. From what I’ve seen it doesn’t seem to bother them. 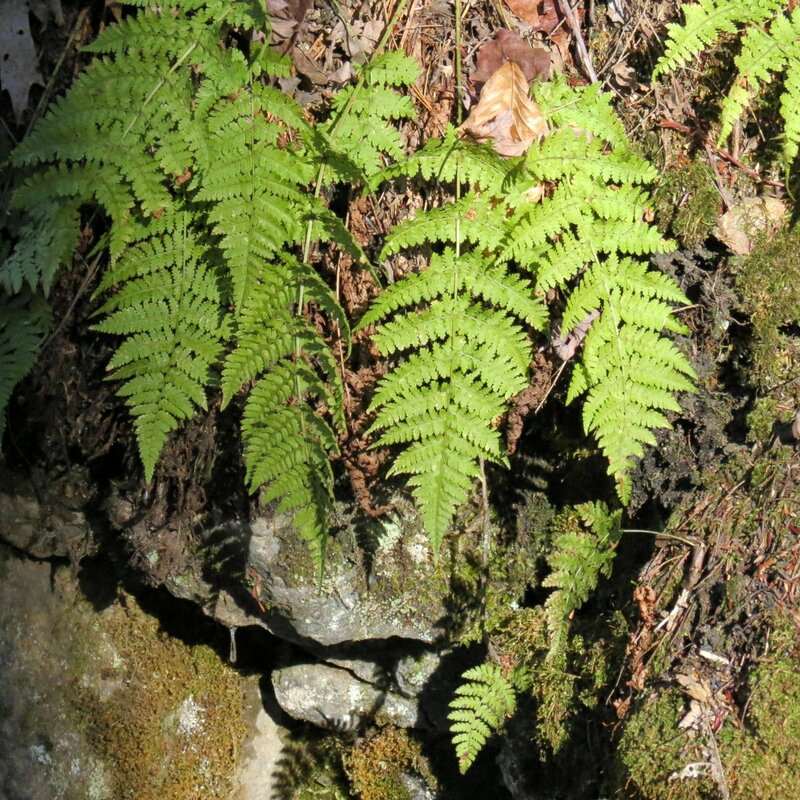 Any thoughts I had about the delicacy of our evergreen ferns went right out the window when I saw them growing here. 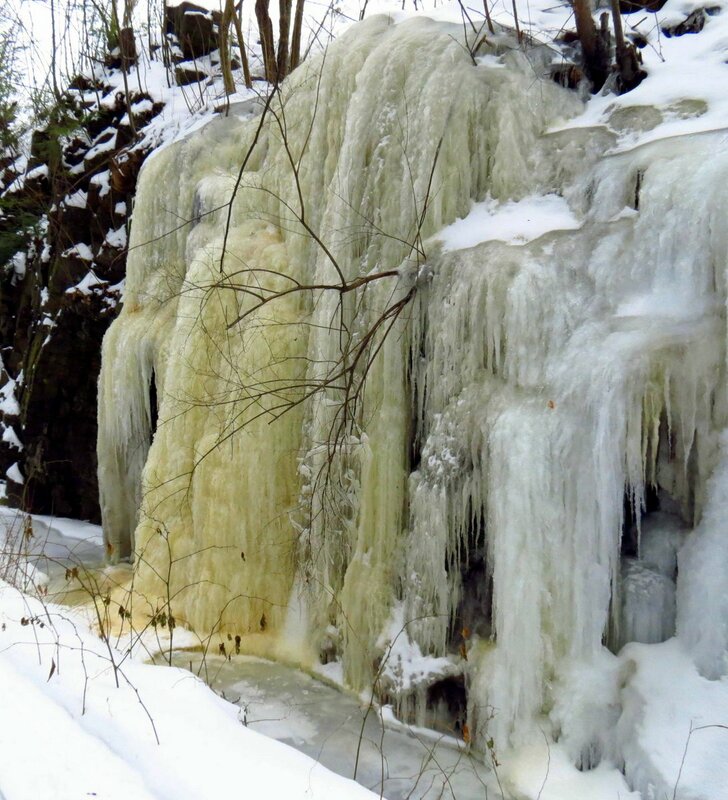 They too are often covered in ice through the winter, but still green. 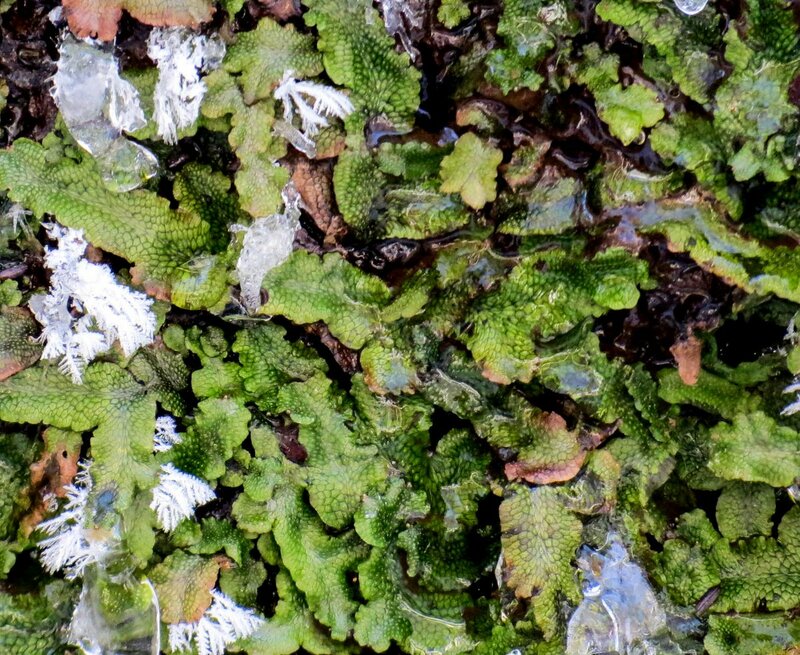 Mosses also have to be able to withstand the ice. Curiously, though this one was surrounded by ice it was quite dry, as its twisted leaves show. I think it might be tall tornado moss (Tortella tortuosa) which has leaves that twist and contort when it dries out. 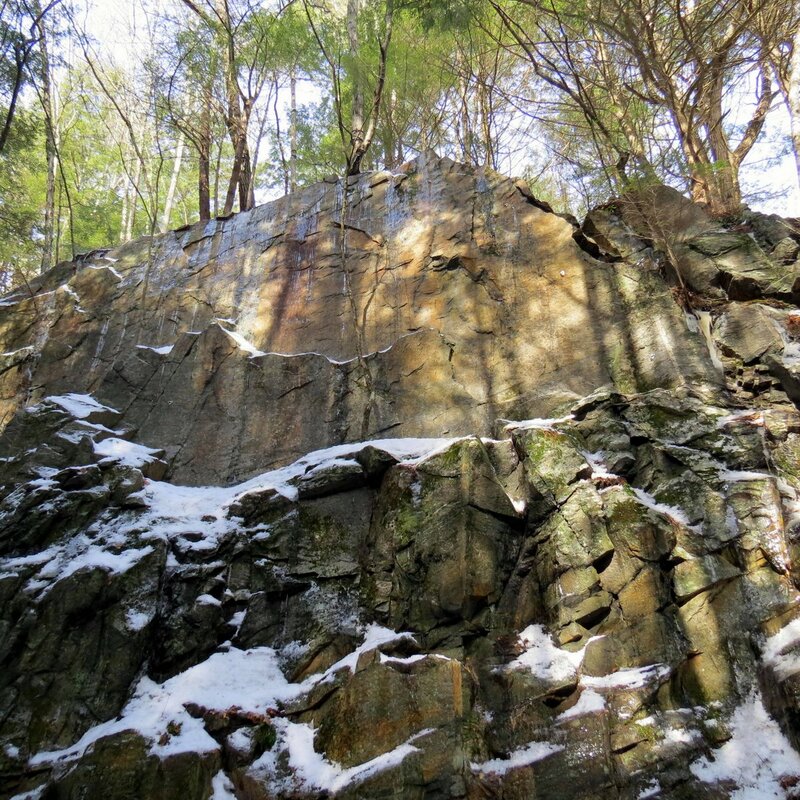 It grows in the thin soil that forms on boulders and on rock ledges, and likes limestone. One of the strangest things that grow here is a green algae called Trentepohlia aurea. 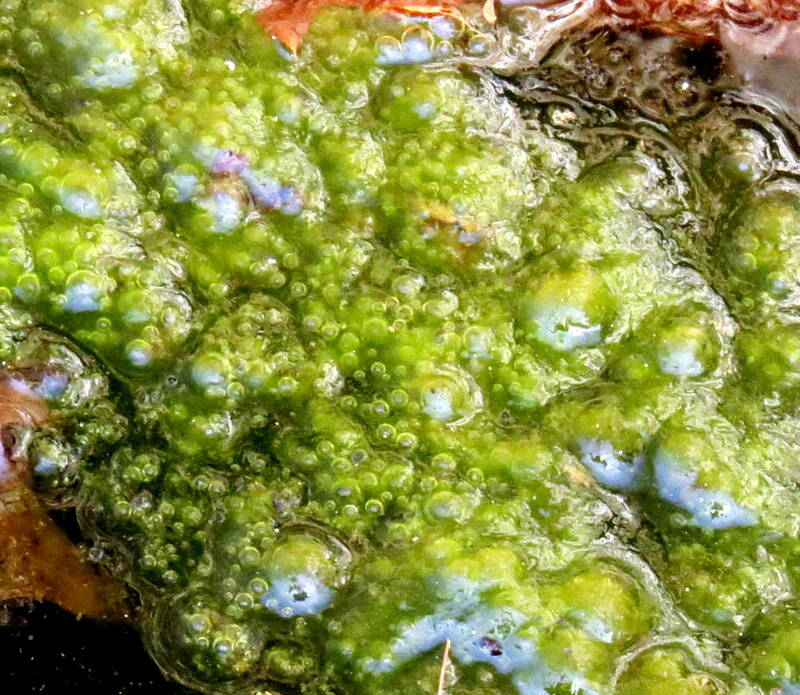 Though it is called green algae a carotenoid pigment in the alga cells called hematochrome or beta- carotene, which is the same pigment that gives carrots their orange color, hides the green chlorophyll. 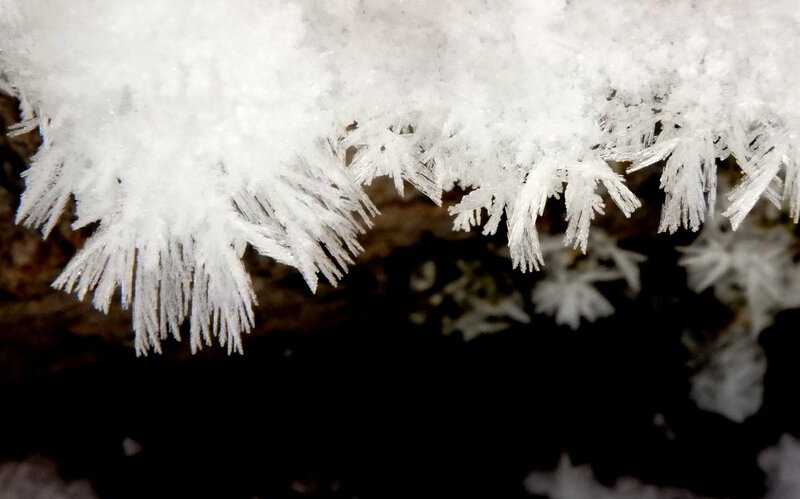 It’s very hairy and produces spores which, when produced in high enough concentrations, can even color rain. I was just reading about a blood red rain that fell in parts of Spain in 2014. Many worried that it was a bad omen or extraterrestrial in origin, or a plague worthy of the Bible, but it was actually caused by the algae Haematococcus pluvialis. The same thing happened in Texas in 2013, in Sri Lanka in 2012, and in India in 2001, each seemingly caused by different algae. Yellow, green, and black rain has also been reported. It seems that colored rain can happen just about anywhere on earth when conditions are right. 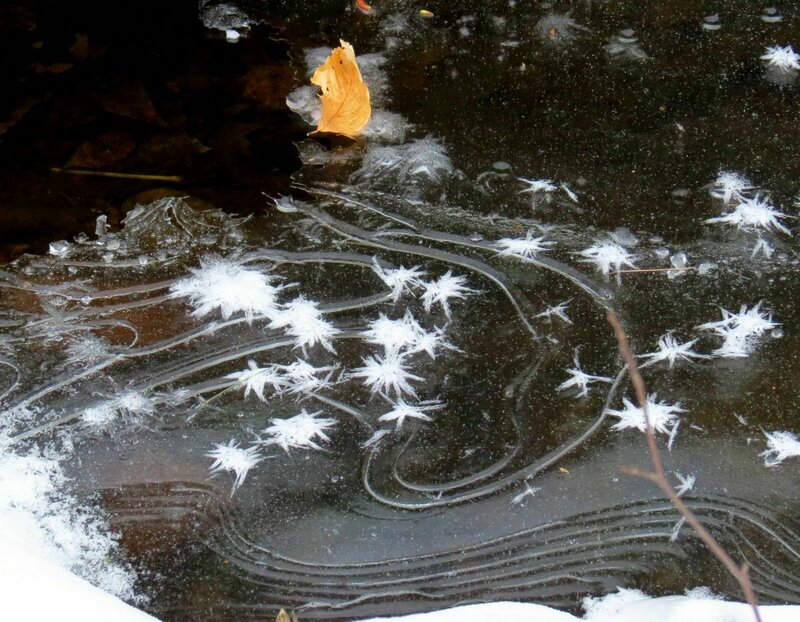 The blue in this photo is the sky reflected in ice. 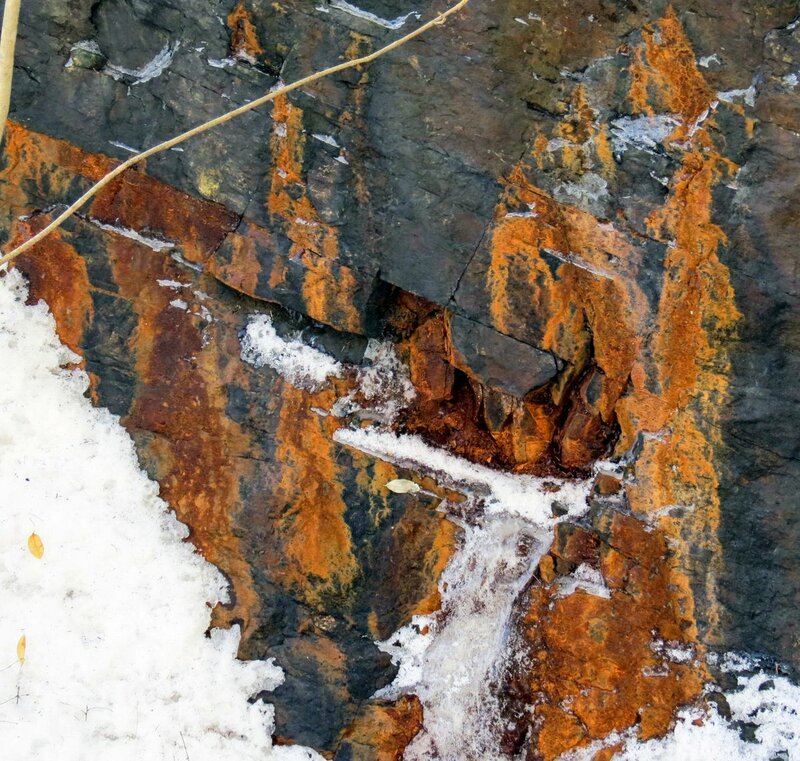 I’ve never seen colored rain falling in this place but I have seen plenty of colored ice, and I think at least some of the ice colors are caused by minerals in the groundwater, like the iron staining shown on the stone in this photo. 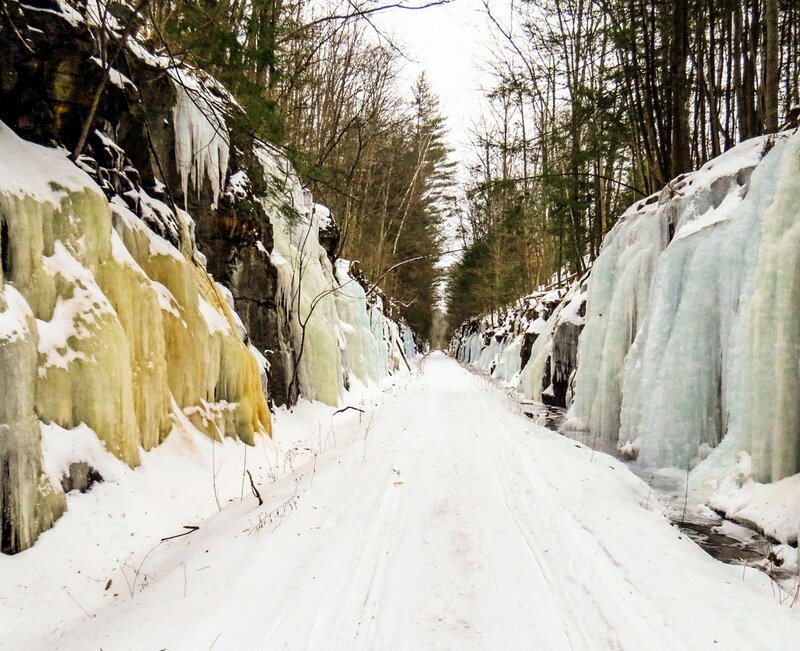 The ice here can be blue, green, red, orange, yellow, brown, and even black. 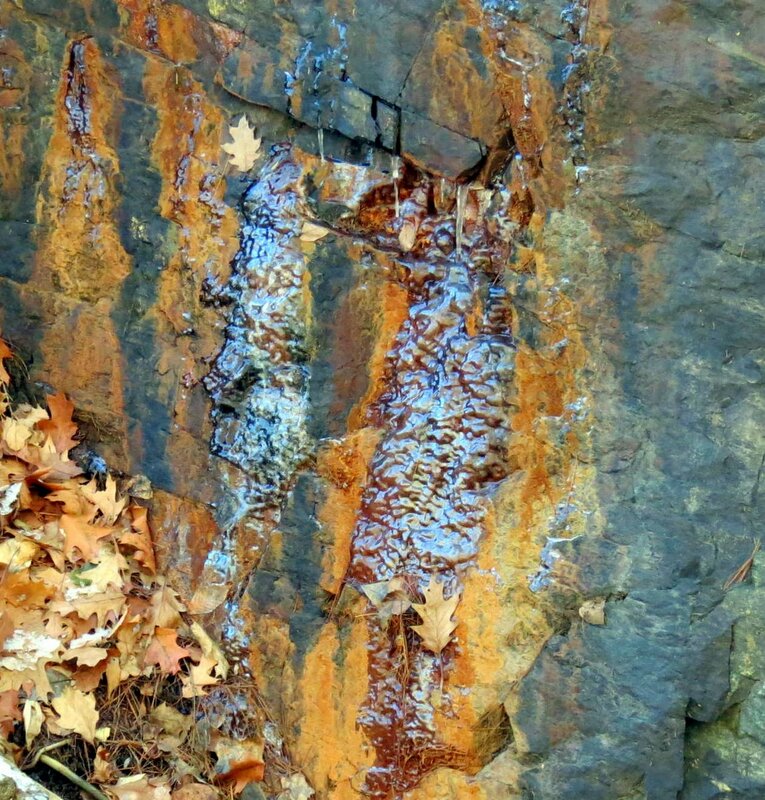 Another example of mineral staining on the stone, this time in a sandy, orangey brown color. 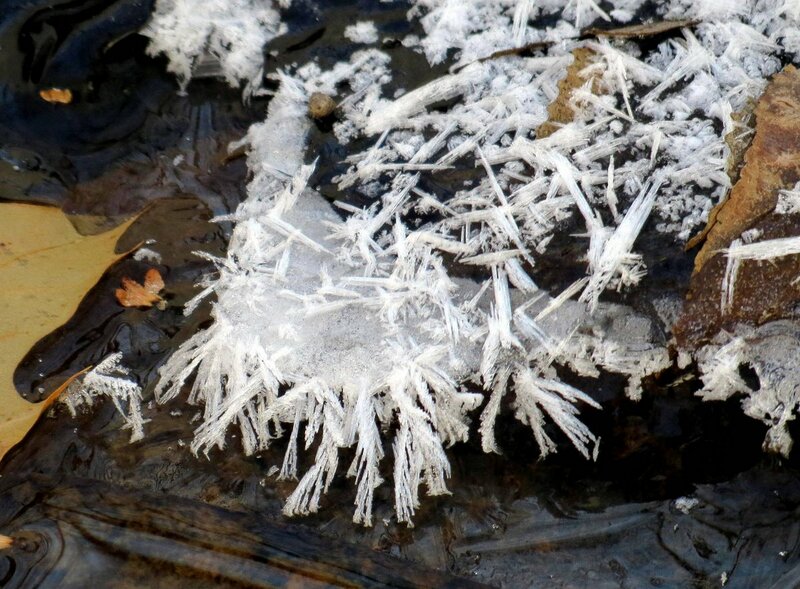 And this photo from last year shows what the minerals can do to the ice. At least that’s my assumption. 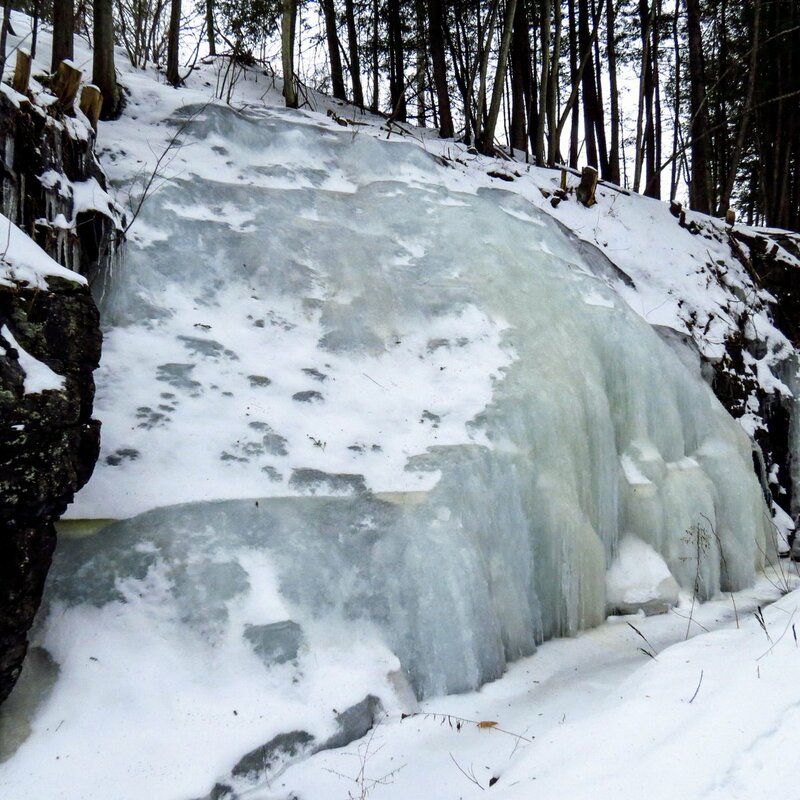 Neither I nor readers of this blog have been able to come up with any other theories except in the case of blue ice, which can become blue simply because of its own density. Watching ice melt might not be very exciting but watching it grow is, so I’ll be coming back here often throughout winter.